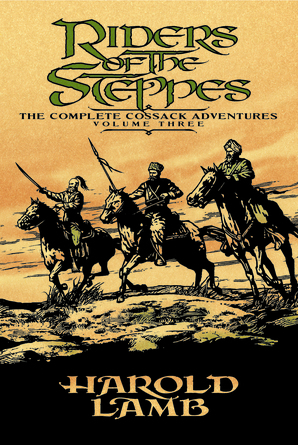 "For no one in the Zaporogian Siech, the war encampment of the Cossacks along the bank of Father Dnieper, not even the Koshevoi Ataman himself, was better known to the Khan Mirai Tkha than Khlit, the Wolf." 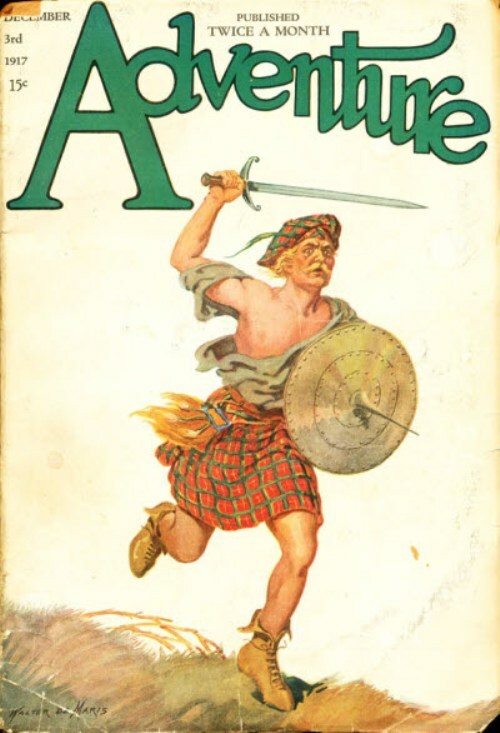 — Harold Lamb, "Wolf's War"
Harold A. Lamb (1892 - 1962) was perhaps best known for his historical writing, works such as Genghis Khan: The Emperor of All Men (Doubleday 1927), Tamerlane: The Earth Shaker (Doubleday 1928), Alexander of Macedon: The Journey to World's End (Doubleday 1946), Charlemagne: The Legend and the Man (Doubleday 1954) and Hannibal: One Man Against Rome (Doubleday 1958). 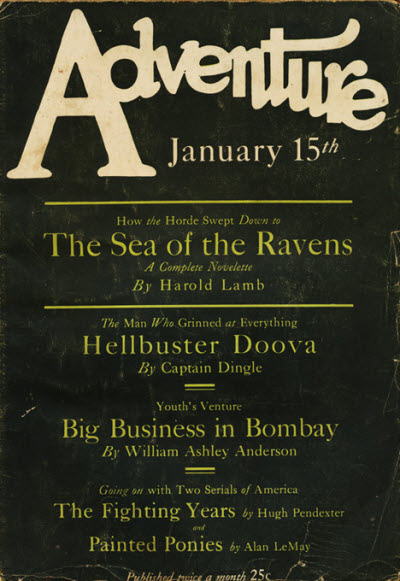 But before he turned to non-fiction Lamb was an accomplished writer of historical adventure fiction, publishing stories in pulp magazines like Adventure and Argosy and novels like Marching Sands (Appleton 1920), The House of the Falcon (Appleton 1921), Durandal: A Crusader in the Horde (Doubleday 1931), Nur Mahal (Doubleday 1932) and Omar Khayyam (Doubleday 1934). 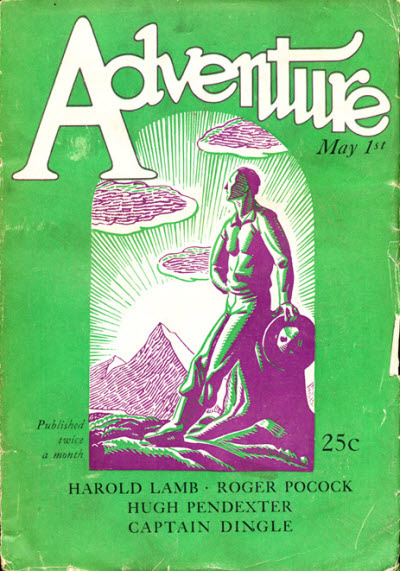 This site celebrates Lamb's adventure fiction. 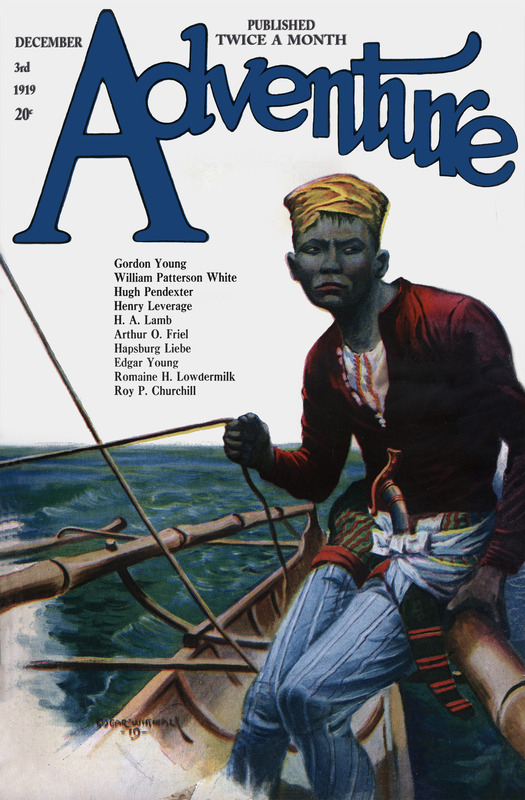 "The Impossible Fleet," in Top-Notch Magazine, Vol. 24, No. 2, November 1, 1915, pp. 109-127. 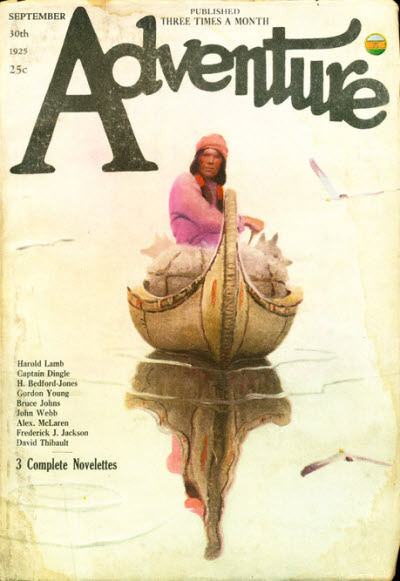 "The Player Invisible," in Top-Notch Magazine, Vol. 26, No. 1, April 1, 1916, pp. 172-191. "Tragic Gleams," in Top-Notch Magazine, Vol. 26, No. 3, May 1, 1916, pp. 81-96. 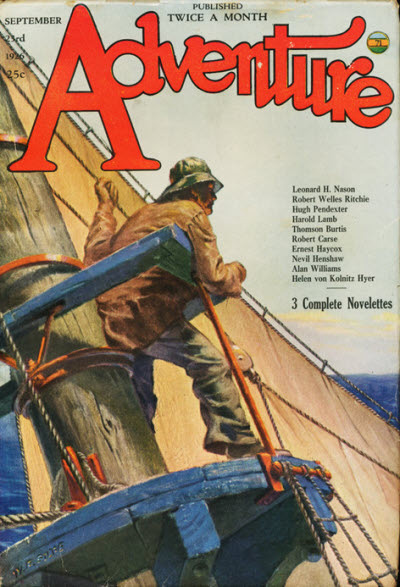 "Somewhere in the Pacific," in All-Story, Vol. 70, No. 3, April 28, 1917, pp. _____. "Expert Proficiency," in All-Story, Vol. 72, No. 3, June 23, 1917, pp. _____. 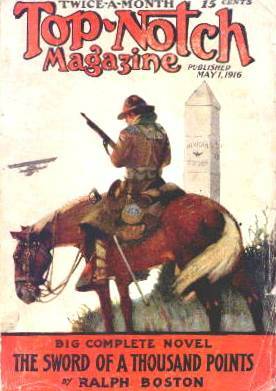 "Russell's 1917 Model," in All-Story, Vol. 73, No. 1, July 7, 1917, pp. _____. Swords of the Steppes , Howard Andrew Jones, ed., Lincoln, Nebraska: Bison, 2007, pp. 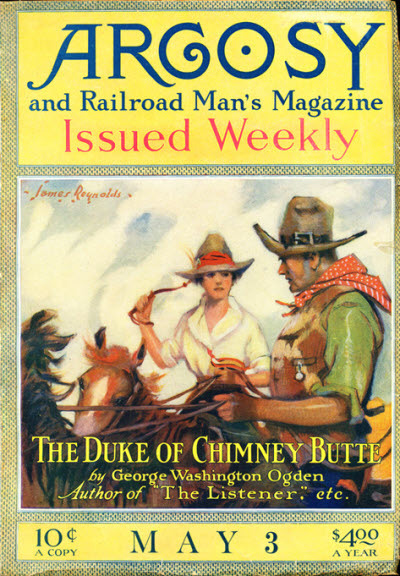 572-610, with cover illustration by Darrel Stevens. Swords from the Sea , Howard Andrew Jones, ed., Lincoln, Nebraska: Bison, 2010, pp. 521-542, with cover illustration by Darrel Stevens. The Mighty Manslayer , Marc B. Haefele, ed. (uncredited), Garden City, New York: Doubleday, 1969, pp. 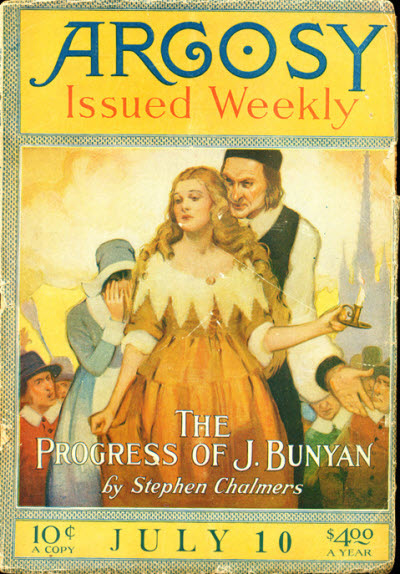 3-13, with dust jacket illustration by Saul Lambert. The Mighty Manslayer , Marc B. Haefele, ed. (uncredited), New York: Curtis Books / Modern Literary Editions, 1969, pp. 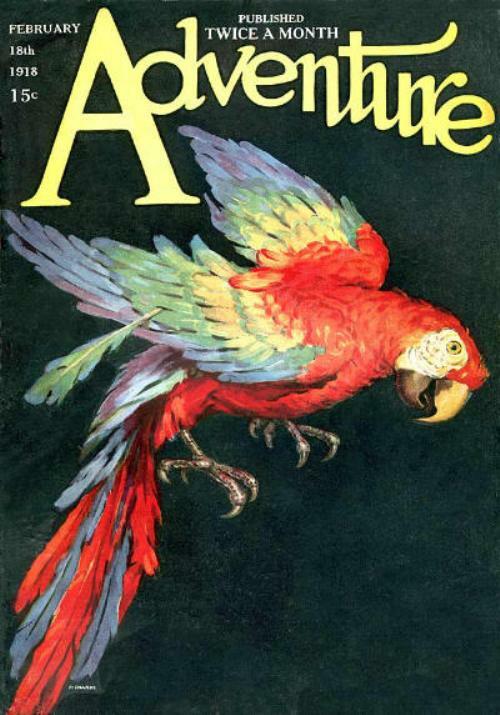 _____, with cover illustration by unknown artist. Wolf of the Steppes , Howard Andrew Jones, ed., Lincoln, Nebraska: Bison, 2006, pp. 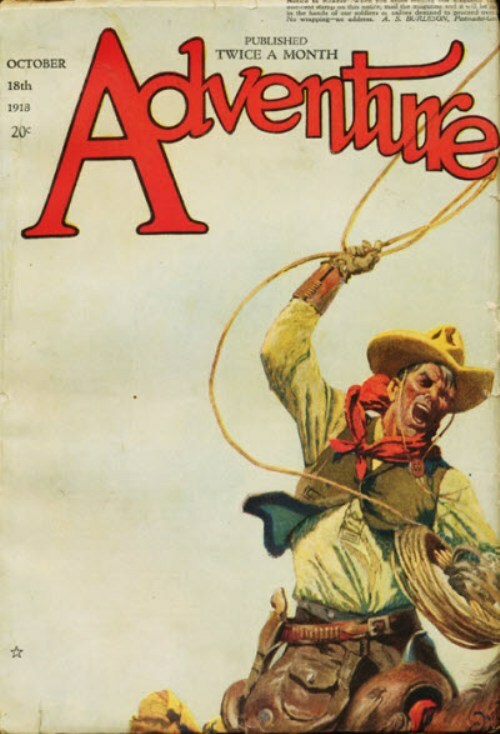 1-11, with cover illustration by Darrel Stevens. 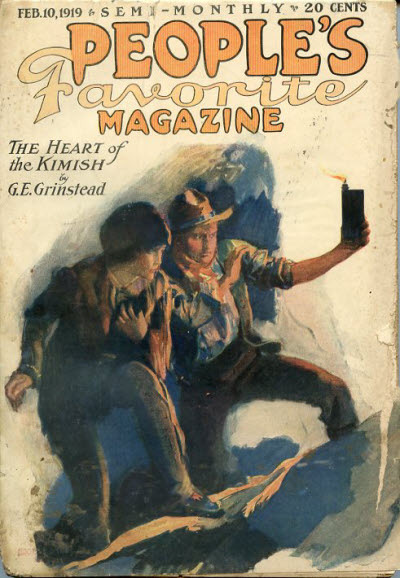 "Mystic Lights," in Top-Notch Magazine, Vol. 32, No. 4, November 15, 1917, pp. 69-85. 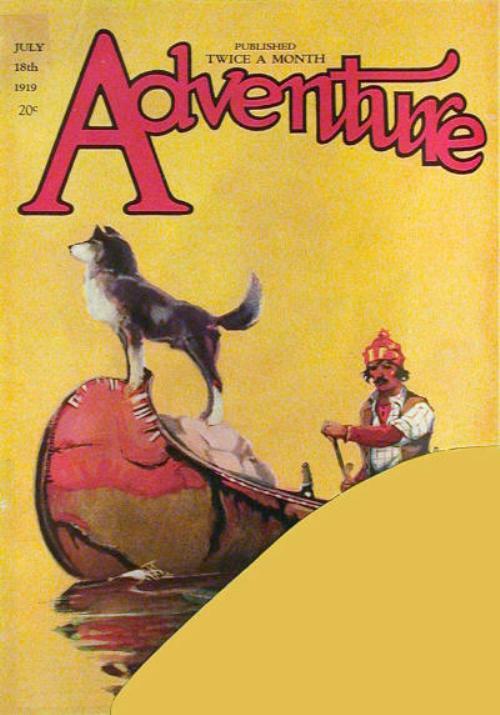 "The Island of Changing Shapes," in Adventure, Vol. 15, No. 5, December 3, 1917, pp. _____. 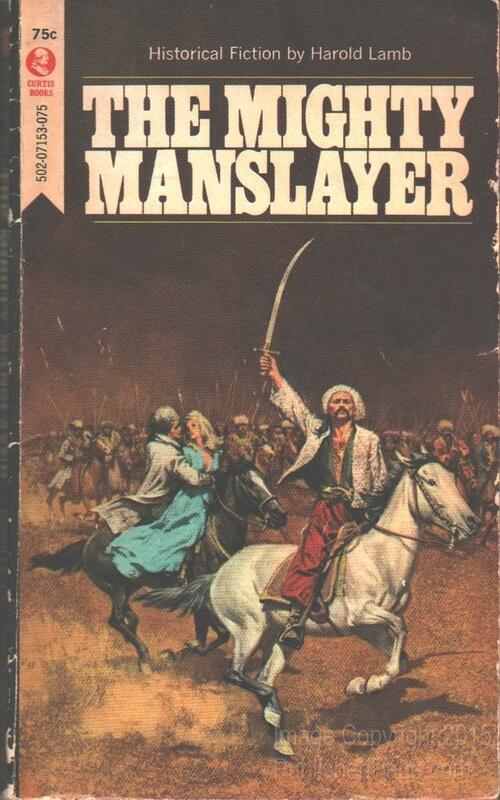 The Mighty Manslayer , Marc B. Haefele, ed. (uncredited), Garden City, New York: Doubleday, 1969, pp. 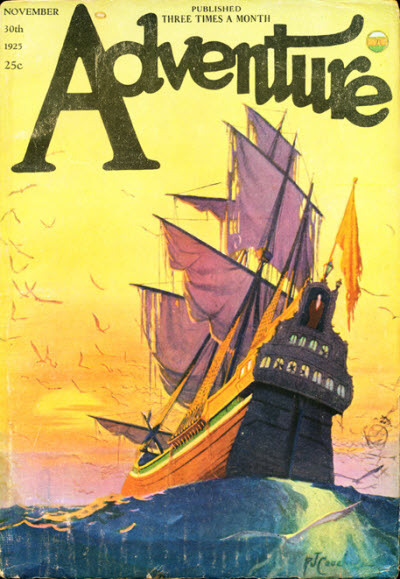 14-43, with dust jacket illustration by Saul Lambert. Wolf of the Steppes , Howard Andrew Jones, ed., Lincoln, Nebraska: Bison, 2006, pp. 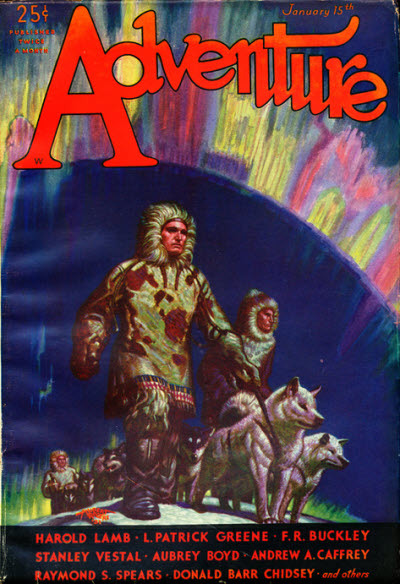 12-40, with cover illustration by Darrel Stevens. The Mighty Manslayer , Marc B. Haefele, ed. (uncredited), Garden City, New York: Doubleday, 1969, pp. 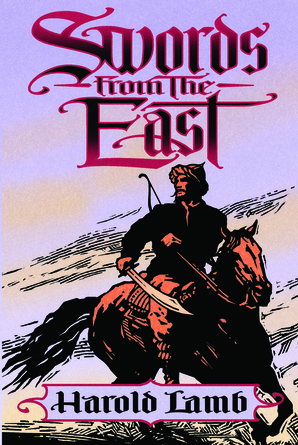 44-88, with dust jacket illustration by Saul Lambert. Wolf of the Steppes , Howard Andrew Jones, ed., Lincoln, Nebraska: Bison, 2006, pp. 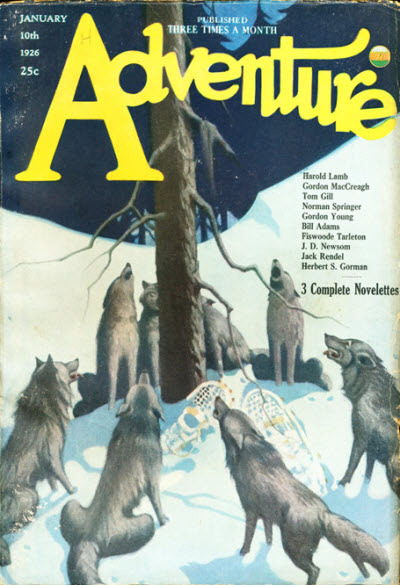 41-84, with cover illustration by Darrel Stevens. 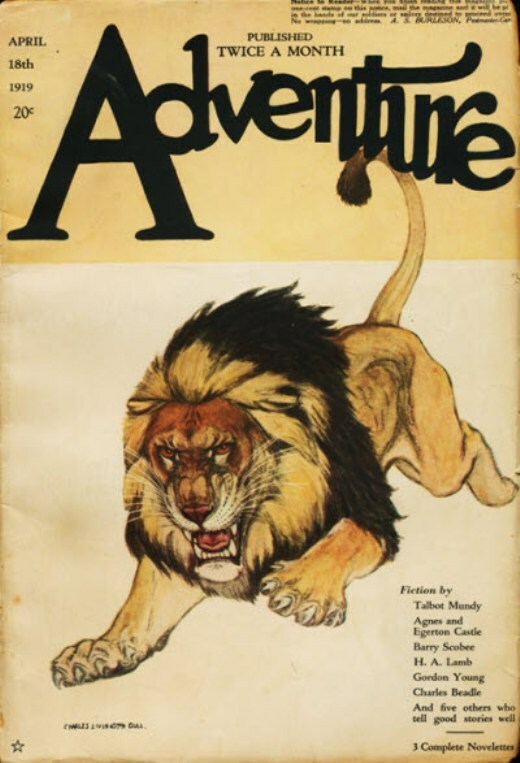 "Dorgan's Devil-Devil," in Adventure, Vol. 16, No. 6, March 18, 1918, pp. _____. "The Mountain Call," in Top-Notch, Vol. 34, No. 4, May 15, 1918, pp. 104-128. The Curved Saber , uncredited editor, Garden City, New York: Doubleday, 1964, pp. 1-60, with dust jacket photograph by James Viles. Wolf of the Steppes , Howard Andrew Jones, ed., Lincoln, Nebraska: Bison, 2006, pp. 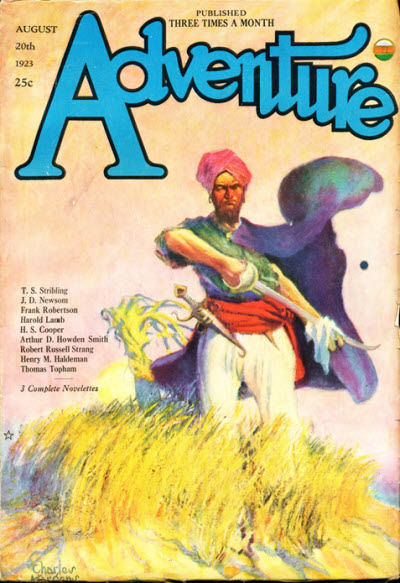 85-153, with cover illustration by Darrel Stevens. "Fire Circle," in Top-Notch, Vol. 36, No. 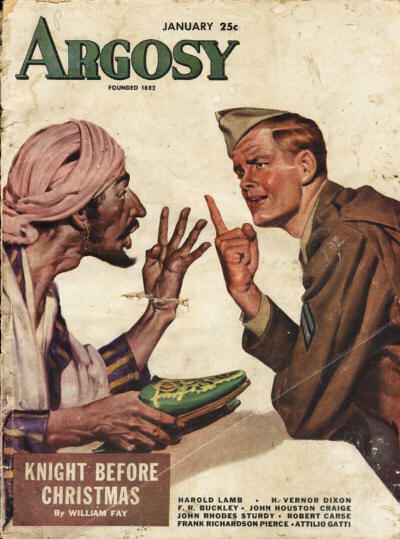 1, October 1, 1918, pp. 107-119. The Curved Saber , uncredited editor, Garden City, New York: Doubleday, 1964, pp. 61-125, with dust jacket photograph by James Viles. Wolf of the Steppes , Howard Andrew Jones, ed., Lincoln, Nebraska: Bison, 2006, pp. 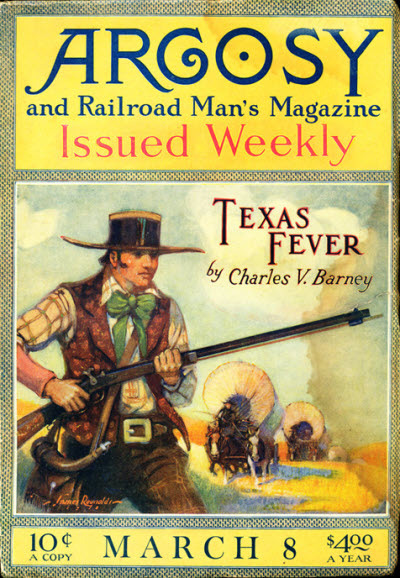 154-228, with cover illustration by Darrel Stevens. "The House of Hidden Faces," in Adventure, Vol. 19, No. 5, December 3, 1918, pp. _____. "The Lake of Long Dreams," in All-Story, Vol. 91, No. 3, December 7, 1918, pp. _____. The Mighty Manslayer , Marc B. Haefele, ed. (uncredited), Garden City, New York: Doubleday, 1969, pp. 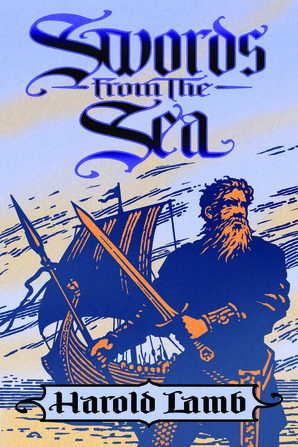 89-156, with dust jacket illustration by Saul Lambert. Wolf of the Steppes , Howard Andrew Jones, ed., Lincoln, Nebraska: Bison, 2006, pp. 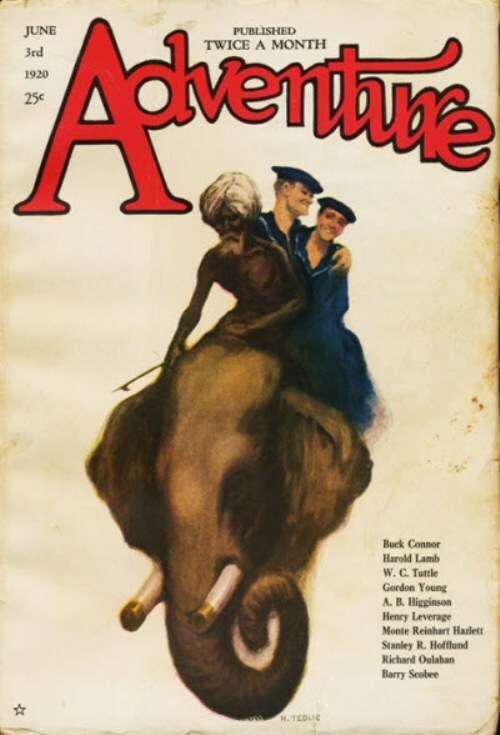 229-294, with cover illustration by Darrel Stevens. 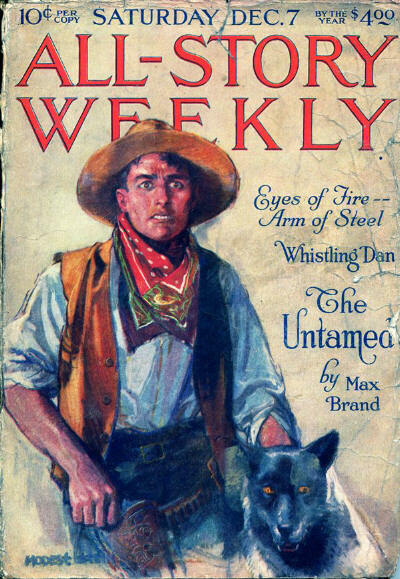 "The Lost Dare-Devil," in People's Favorite, Vol. 29, No. 1, December 25, 1918, pp. 52-69. 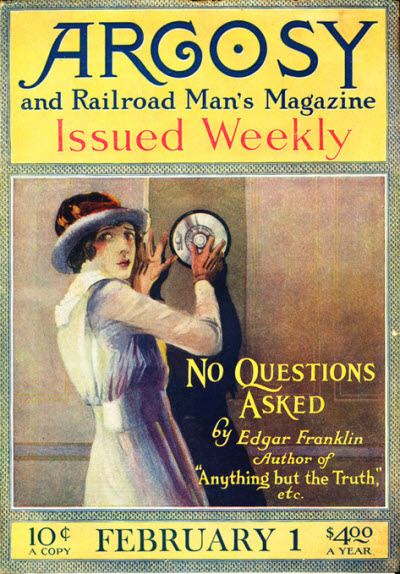 "Under the Black Ball," in Peoples Favorite Magazine, Vol. 29, No. 2, January 10, 1919, pp. 64-81. "McKechnie's Trade," in All-Story, Vol. 92, No. 4, January 11, 1919, pp. _____. 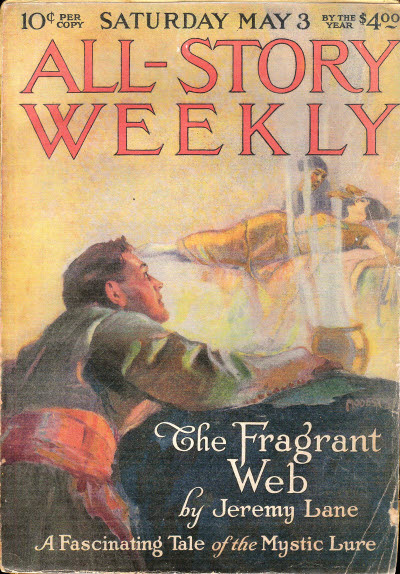 "The Red String," in Argosy, Vol. 103, No. 3, January 11, 1919, pp. 411-434. 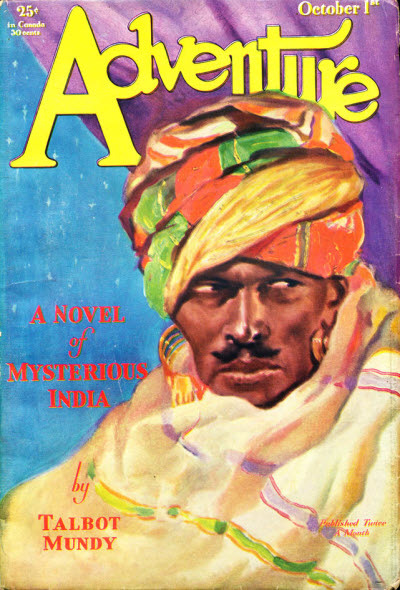 "Channa's Tabu," in All-Story, Vol. 93, No. 2, January 25, 1919, pp. 317-322. 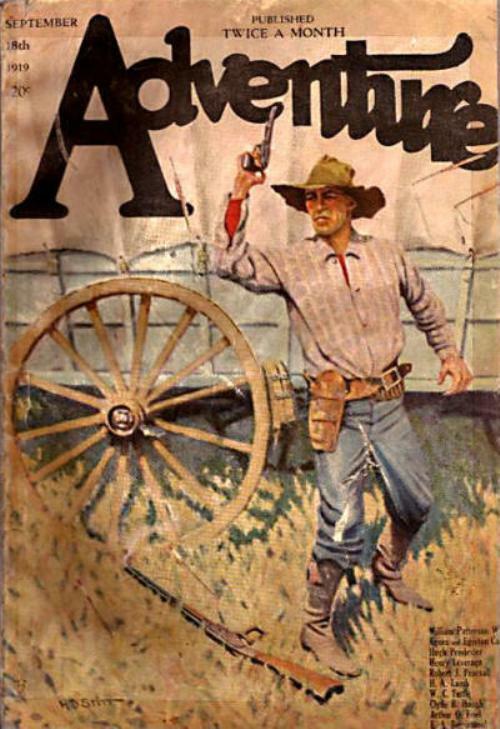 "One Share of Kentucky Pete," in Argosy and Railroad Man's, Vol. 104, No. 2, February 1, 1919, pp. 281-288. "Between the Devil and—," in All-Story, Vol. 93, No. 4, February 8, 1919, pp. 605-611. 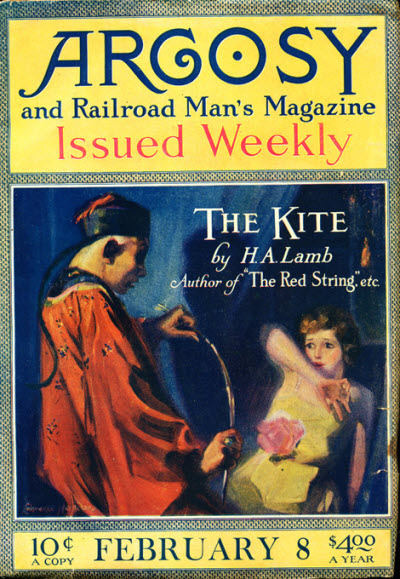 "The Kite," in Argosy and Railroad Man's, Vol. 104, No. 3, February 8, 1919, pp. 417-440. The Curved Saber , uncredited editor, Garden City, New York: Doubleday, 1964, pp. 126-192, with dust jacket photograph by James Viles. Wolf of the Steppes , Howard Andrew Jones, ed., Lincoln, Nebraska: Bison, 2006, pp. 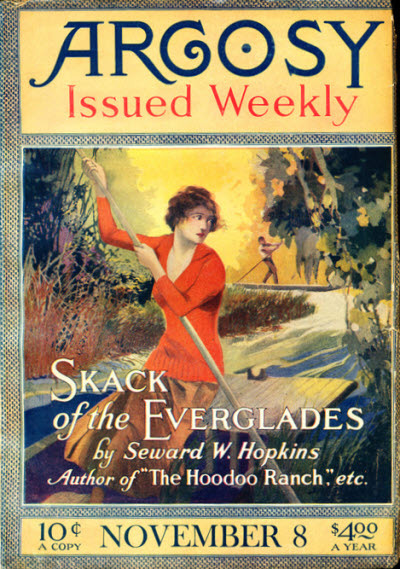 295-371, with cover illustration by Darrel Stevens. 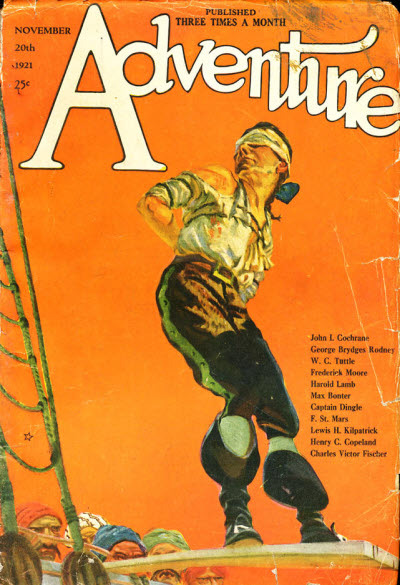 "Call of the Caribbean," in People's Favorite, Vol. 29, No. 4, February 10, 1919, pp. 87-110. Thrills, Vol. 1, No. 5, September 1927, pp. 59-71 (part 1). Thrills, Vol. 1, No. 6, November 1927, pp. 99-110 (part 2). 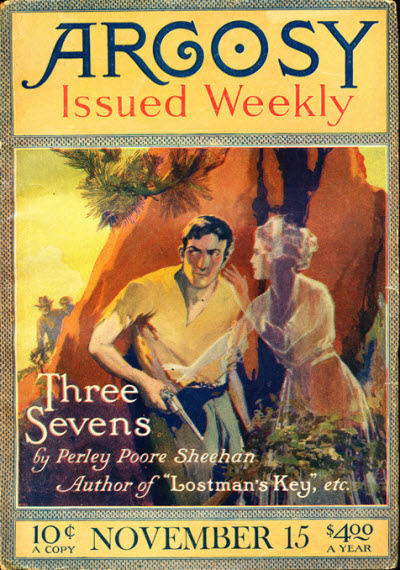 "Lost Land," in People's Favorite Magazine, Vol. 30, No. 1, March 25, 1919, pp. 76-99. 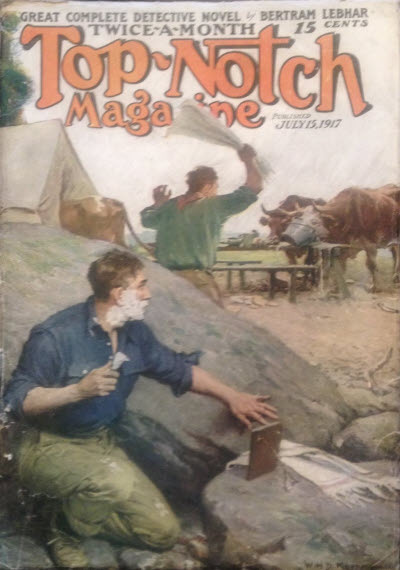 "Two Hands on One," in Argosy and Railroad Man's Magazine, Vol. 106, No. 2, March 29, 1919, pp. 227-239. The Curved Saber , uncredited editor, Garden City, New York: Doubleday, 1964, pp. 193-254, with dust jacket photograph by James Viles. Wolf of the Steppes , Howard Andrew Jones, ed., Lincoln, Nebraska: Bison, 2006, pp. 372-442, with cover illustration by Darrel Stevens. 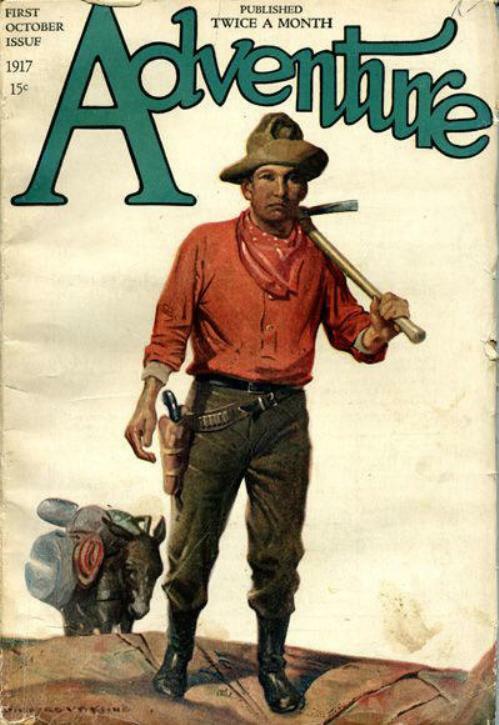 "Profit," in Argosy and Railroad Man's Magazine, Vol. 107, No. 3, May 3, 1919, pp. 510-515. 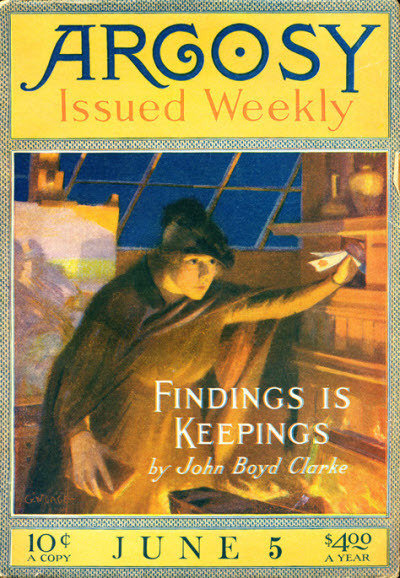 "Takings and Leavings," in All-Story Weekly, Vol. 96, No. 4, May 3, 1919, pp. _____. 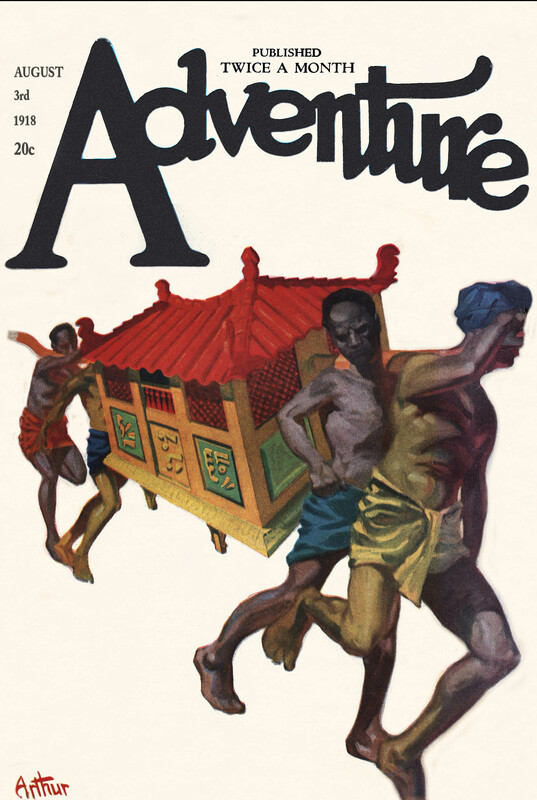 "A Chinaman's Chance," in Argosy and Railroad Man's Magazine, Vol. 108, No. 24, May 24, 1919, pp. 255-262. 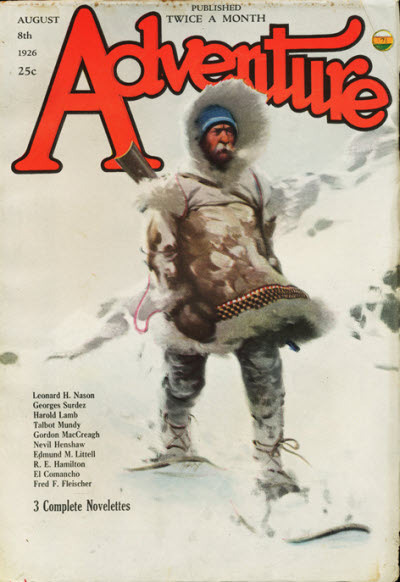 "From the Ends of the Earth," in People's Favorite Magazine, Vol. 30, No. 6, June 10, 1919, pp. 1-48. 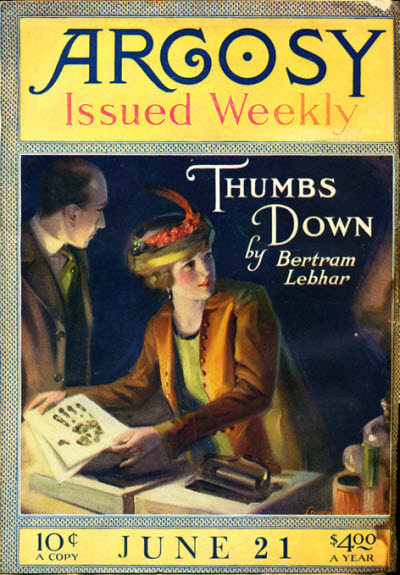 "Twenty Points Up," in Argosy, Vol. 109, No. 2, June 21, 1919, pp. 200-211. The Curved Saber , uncredited editor, Garden City, New York: Doubleday, 1964, pp. 255-324, with dust jacket photograph by James Viles. Wolf of the Steppes , Howard Andrew Jones, ed., Lincoln, Nebraska: Bison, 2006, pp. 443-520, with cover illustration by Darrel Stevens. 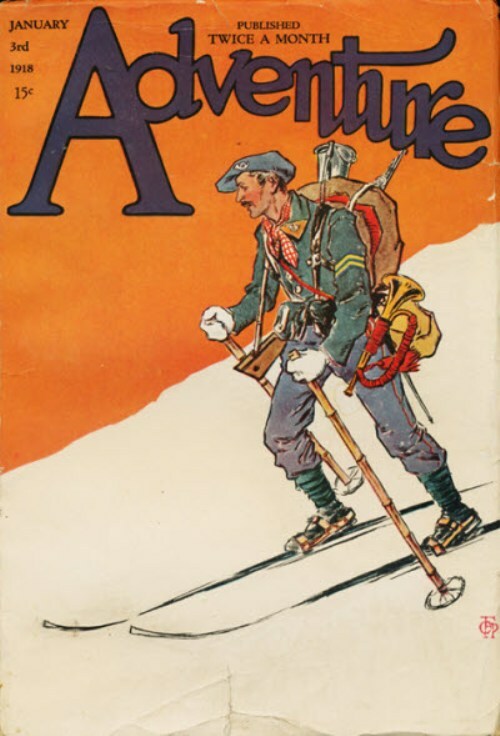 "The Sunwise Turn," in Argosy, Vol. 112, No. 1, September 6, 1919, pp. 61-92. The Curved Saber , uncredited editor, Garden City, New York: Doubleday, 1964, pp. 325-388, with dust jacket photograph by James Viles. Wolf of the Steppes , Howard Andrew Jones, ed., Lincoln, Nebraska: Bison, 2006, pp. 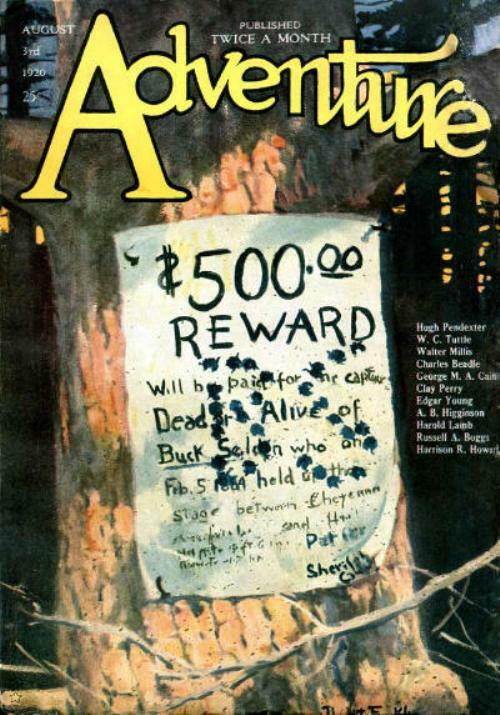 521-594, with cover illustration by Darrel Stevens. 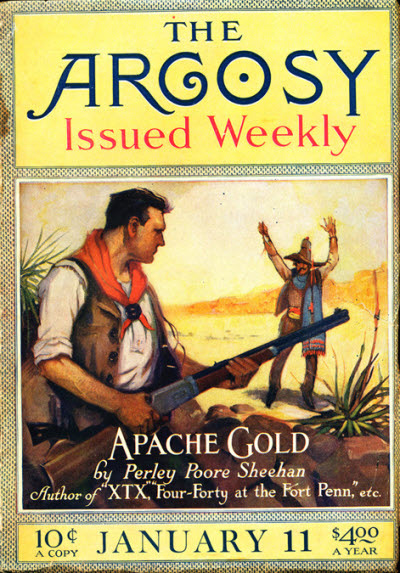 "Chambeau's Investment," in Argosy, Vol. 113, No. 2, October 11, 1919, pp. 332-341. 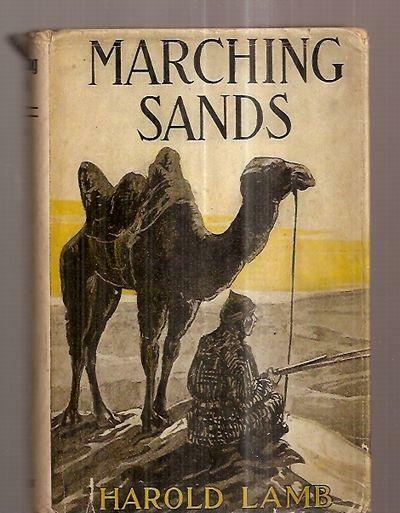 Marching Sands , Harold Lamb, New York: Appleton, 1920, without dust jacket and cover illustration by unknown artist. 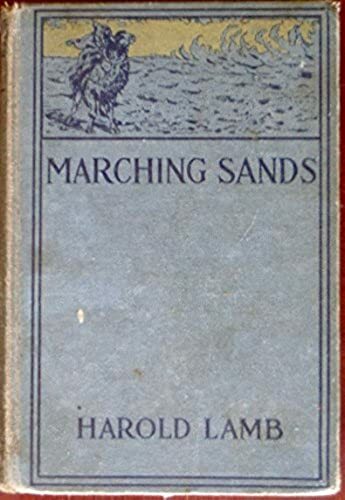 Marching Sands , Harold Lamb, New York: Jacobsen, 1930, with dust jacket illustration by unknown artist. 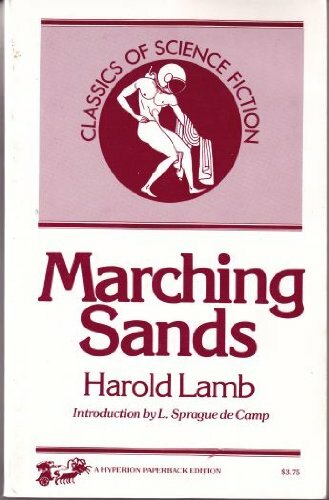 Marching Sands , Harold Lamb, Westport, Connecticut: Hyperion, 1974, without dust jacket. Marching Sands , Harold Lamb, Westport, Connecticut: Hyperion, 1974, with cover illustration by unknown artist. Warriors of the Steppes , Howard Andrew Jones, ed., Lincoln, Nebraska: Bison, 2006, pp. 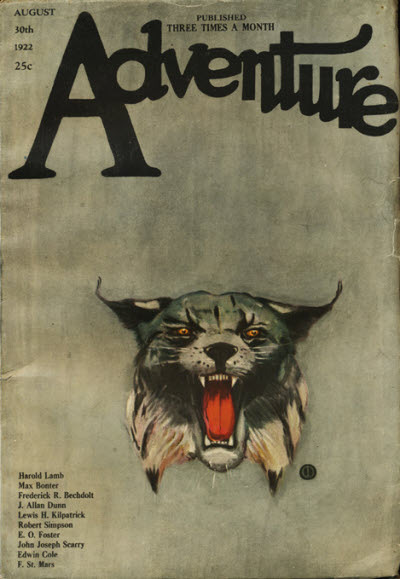 78-104, with cover illustration by Darrel Stevens. Warriors of the Steppes , Howard Andrew Jones, ed., Lincoln, Nebraska: Bison, 2006, pp. 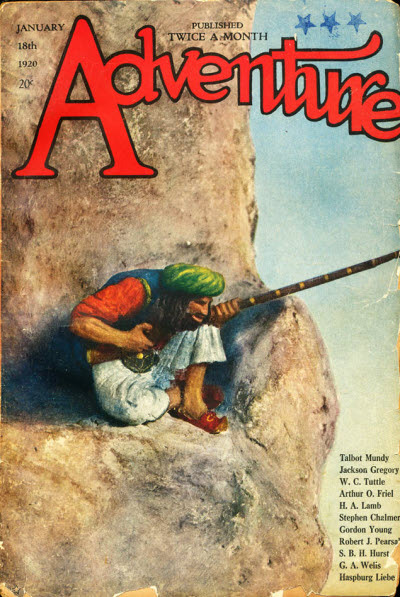 105-127, with cover illustration by Darrel Stevens. "Ships and Sharks," in All-Story Weekly, Vol. 105, No. 1, December 20, 1919, pp. 20-29. 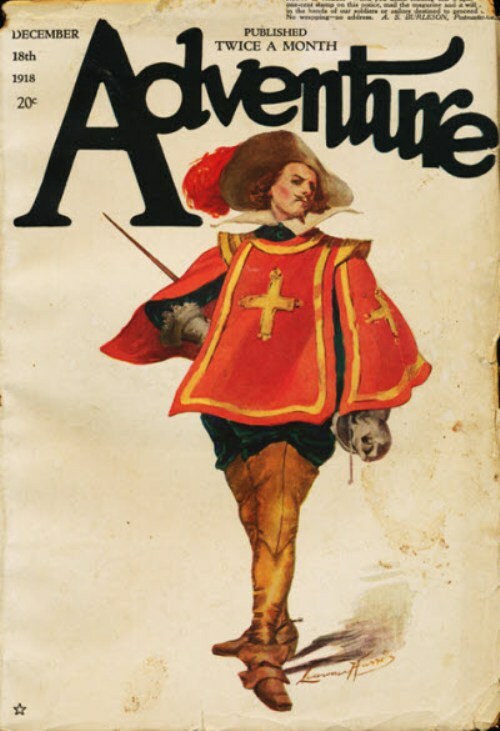 "McCarnie's Second Bet," in Adventure, Vol. 24, No. 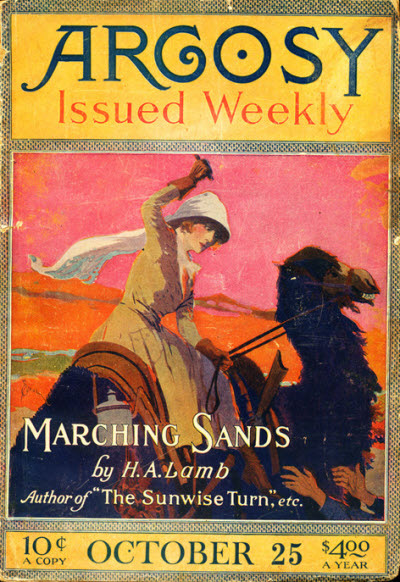 2, Mid-January Issue (January 18), 1920, pp. _____. Warriors of the Steppes , Howard Andrew Jones, ed., Lincoln, Nebraska: Bison, 2006, pp. 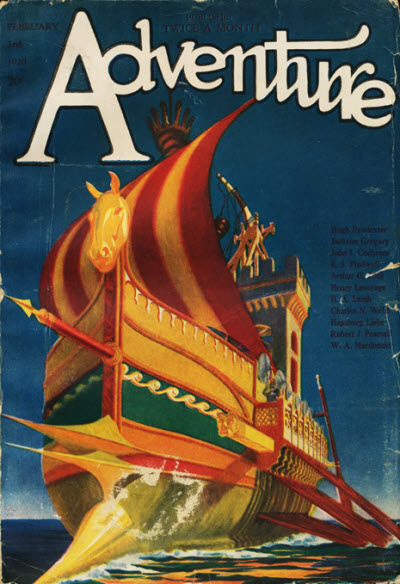 128-152, with cover illustration by Darrel Stevens. 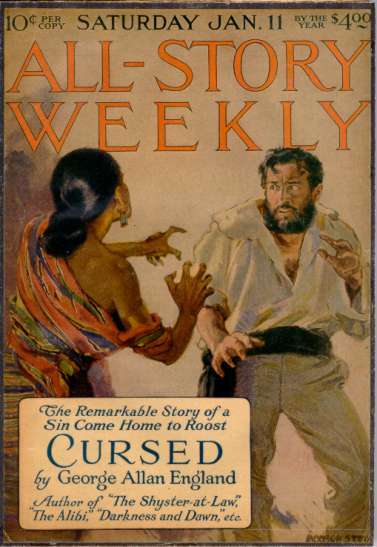 "An Equivalent in Cash," in Argosy, Vol. 118, No. 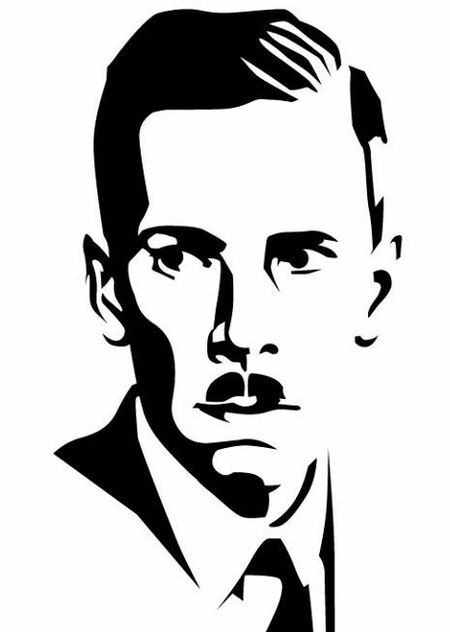 1, February 21, 1920, pp. 66-74. Warriors of the Steppes , Howard Andrew Jones, ed., Lincoln, Nebraska: Bison, 2006, pp. 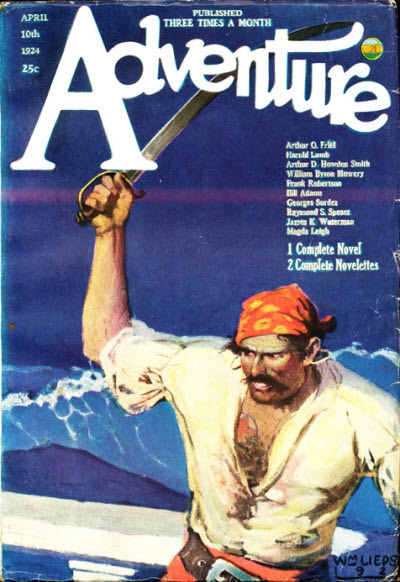 153-177, with cover illustration by Darrel Stevens. Warriors of the Steppes , Howard Andrew Jones, ed., Lincoln, Nebraska: Bison, 2006, pp. 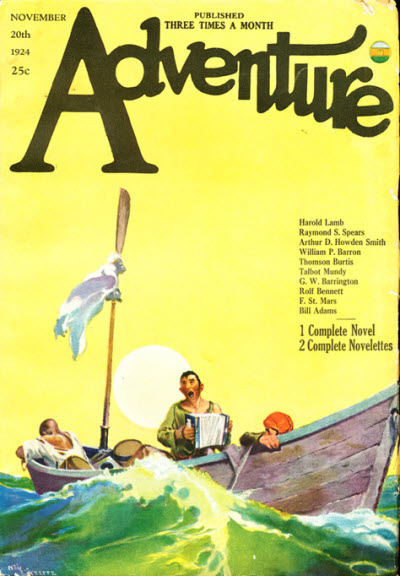 178-299, with cover illustration by Darrel Stevens. 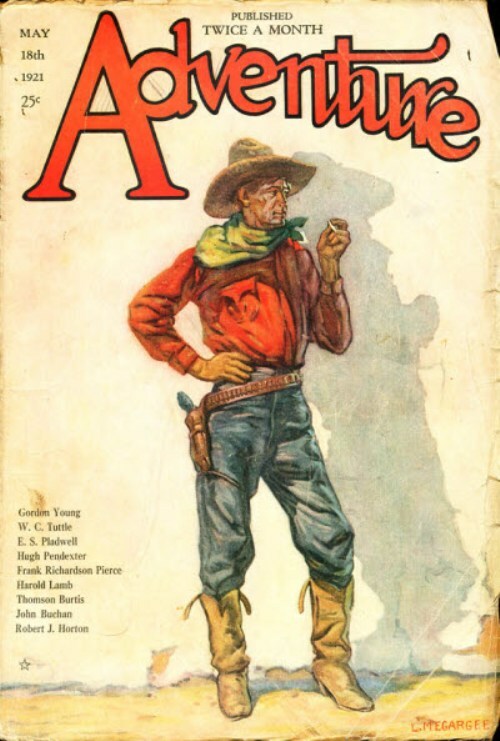 "The Eyes of Ya Long," in Argosy, Vol. 121, No. 1, June 4, 1920, pp. 495-506. The Curved Saber , uncredited editor, Garden City, New York: Doubleday, 1964, pp. 389-457, with dust jacket photograph by James Viles. Warriors of the Steppes , Howard Andrew Jones, ed., Lincoln, Nebraska: Bison, 2006, pp. 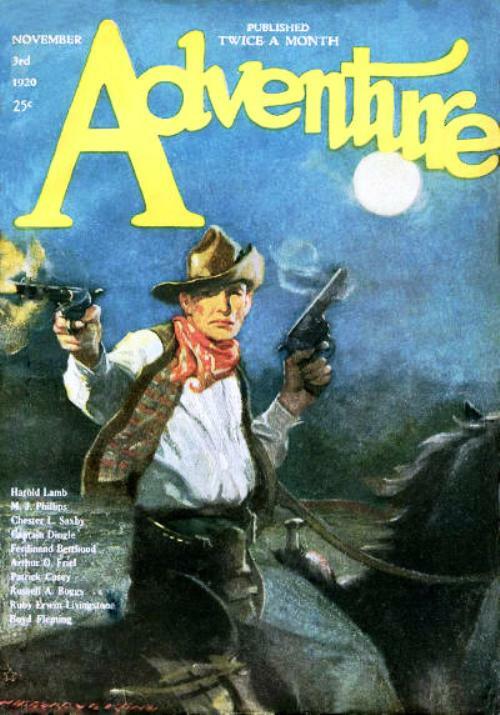 1-77, with cover illustration by Darrel Stevens. The House of the Falcon , Harold Lamb, New York: Appleton, 1921, without dust jacket and with frontispiece illustration by John A. Coughlin. 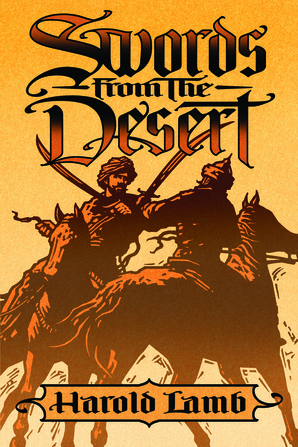 Combined edition of serialized The Caravan of the Dead. The House of the Falcon , Harold Lamb, New York: Robert M. McBride, 1921, without dust jacket. The House of the Falcon , Harold Lamb, New York: Appleton, 1921, without dust jacket and with frontispiece illustration by John A. Coughlin. 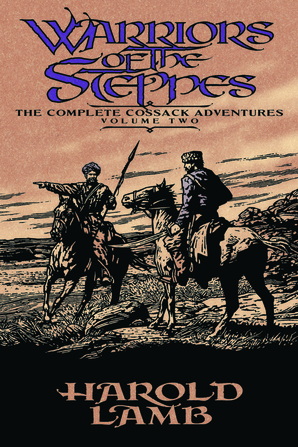 Combined edition of serialized The Caravan of the Dead-. Warriors of the Steppes , Howard Andrew Jones, ed., Lincoln, Nebraska: Bison, 2006, pp. 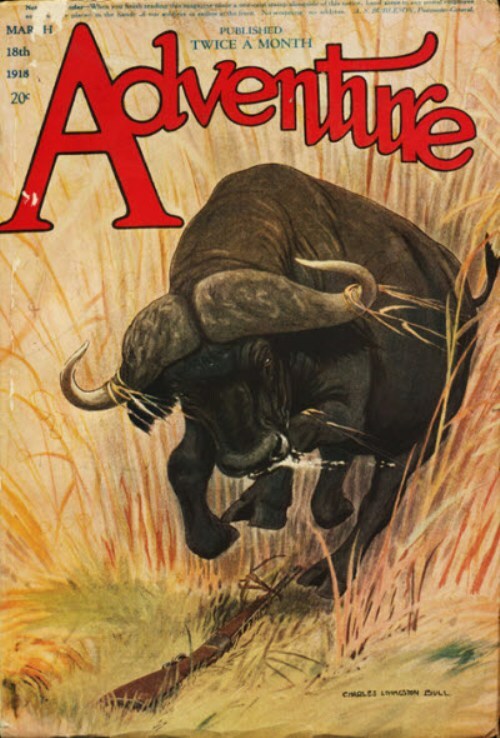 300-359, with cover illustration by Darrel Stevens. The Curved Saber , uncredited editor, Garden City, New York: Doubleday, 1964, pp. 458-510, with dust jacket photograph by James Viles. Warriors of the Steppes , Howard Andrew Jones, ed., Lincoln, Nebraska: Bison, 2006, pp. 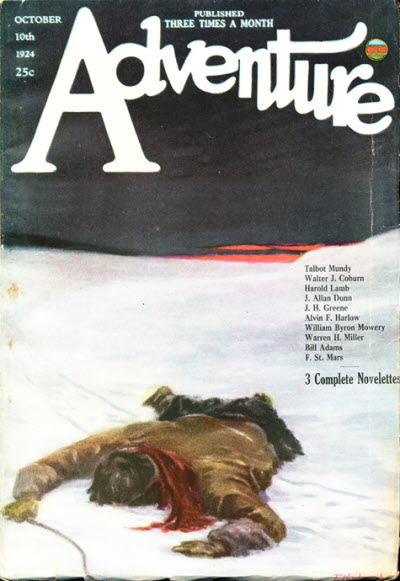 360-419, with cover illustration by Darrel Stevens. Warriors of the Steppes , Howard Andrew Jones, ed., Lincoln, Nebraska: Bison, 2006, pp. 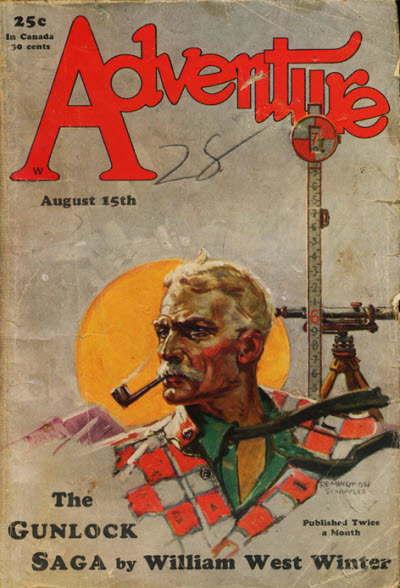 420-487, with cover illustration by Darrel Stevens. Warriors of the Steppes , Howard Andrew Jones, ed., Lincoln, Nebraska: Bison, 2006, pp. 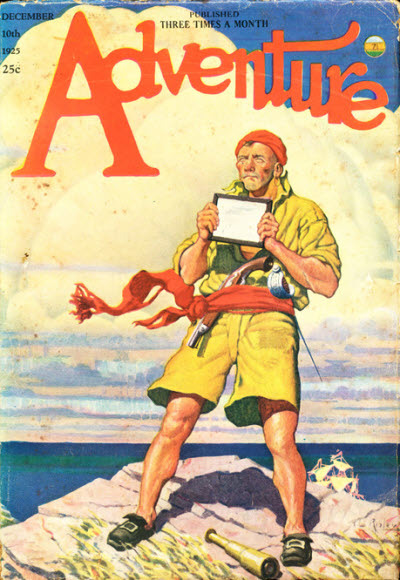 488-620, with cover illustration by Darrel Stevens. "The Last Cabin," in Short Stories, Vol. 94, No. 5 (No. 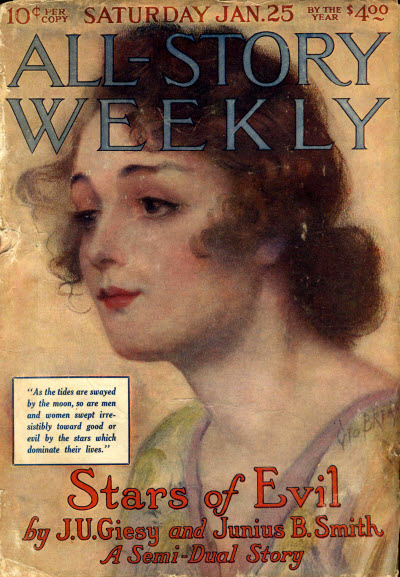 366), November 1920, pp. 97-123. "Two Thousand Years," in Short Stories, Vol. 95, No. 3 (No. 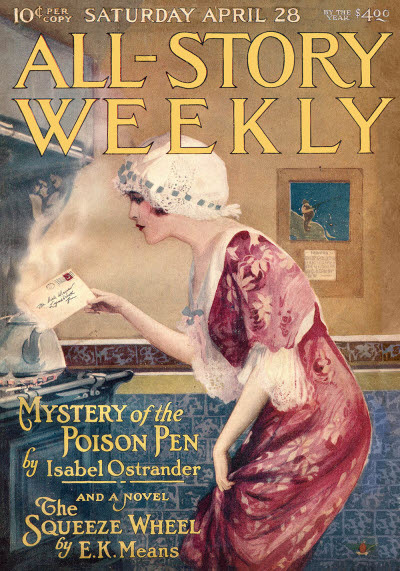 370), March 1921, pp. 140-162. 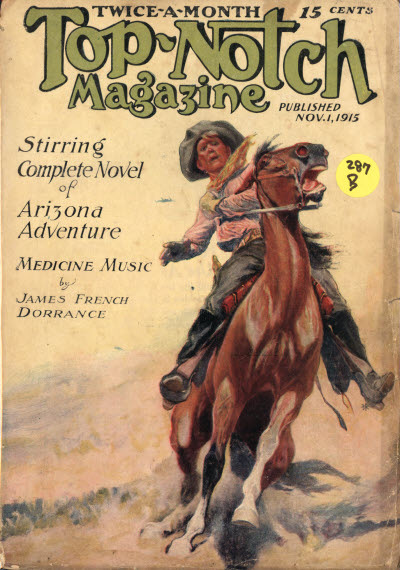 "The Jumping-Off Place," in Argosy All-Story Weekly, Vol. 133, No. 1 (No. 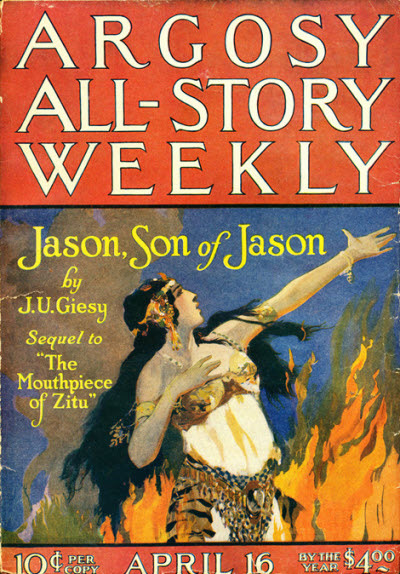 366), April 16, 1921, pp. 21-31. Swords from the West , Howard Andrew Jones, ed., Lincoln, Nebraska: Bison, 2009, pp. 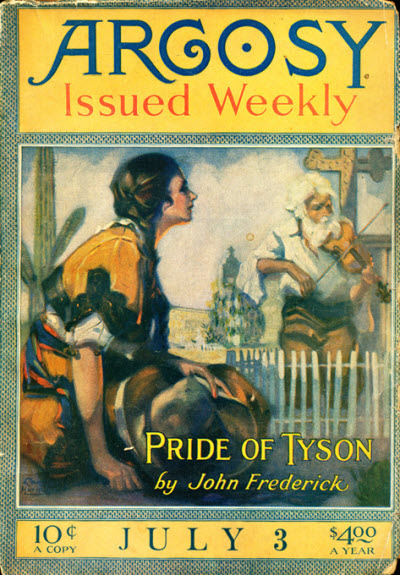 517-563, with cover illustration by Darrel Stevens. Swords from the West , Howard Andrew Jones, ed., Lincoln, Nebraska: Bison, 2009, pp. 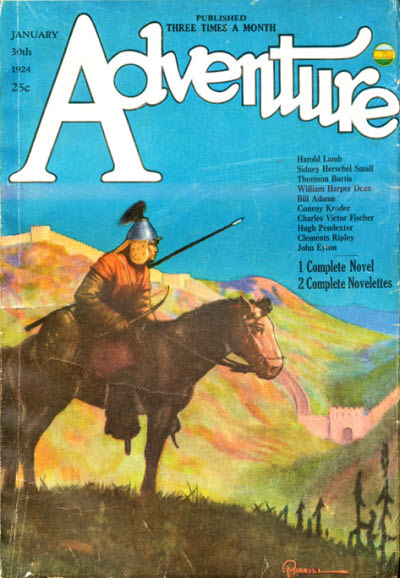 199-316, with cover illustration by Darrel Stevens. "The Make-Weight," in Short Stories, Vol. 96, No. 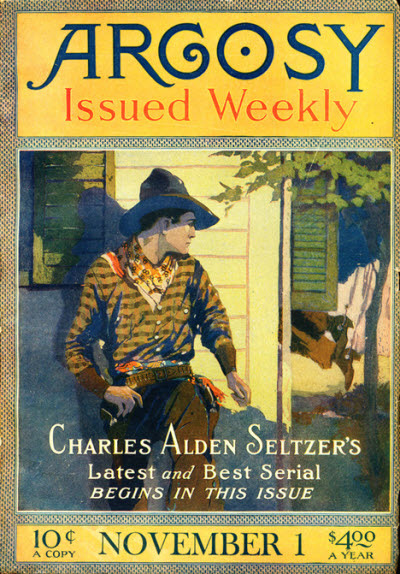 6 (#379), September 25, 1921, pp. 67-76. Swords from the East , Howard Andrew Jones, ed., Lincoln, Nebraska: Bison, 2010, pp. 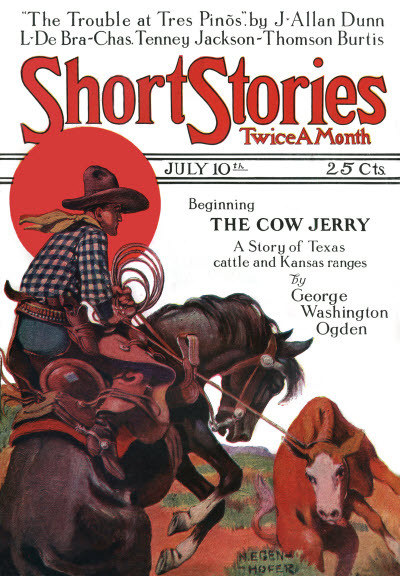 192-204, with cover illustration by Darrel Stevens. 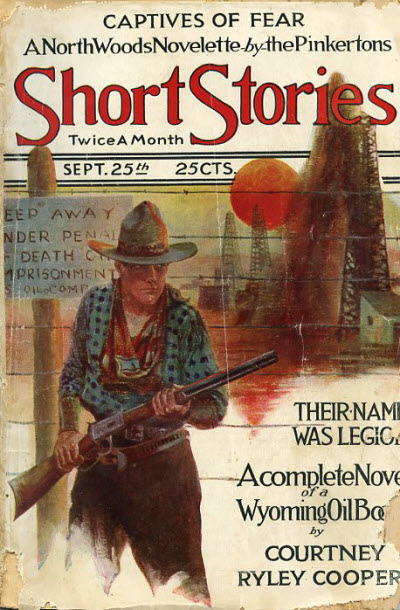 "Justice of the Lone Lands," in Short Stories, Vol. 97, No. 6 (No. 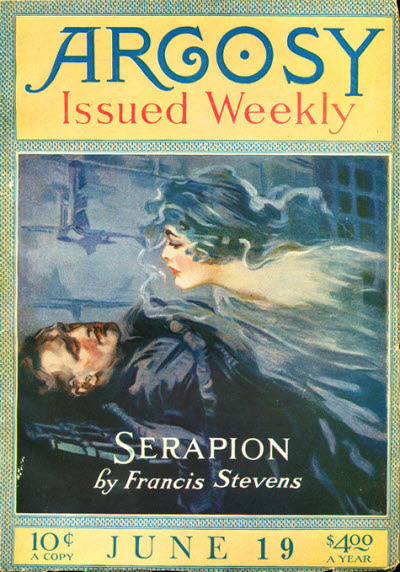 385), December 25, 1921, pp. 112-119. The House of the Falcon , Harold Lamb, New York: Appleton, 1921, without dust jacket and with frontispiece illustration by John A. Coughlin. 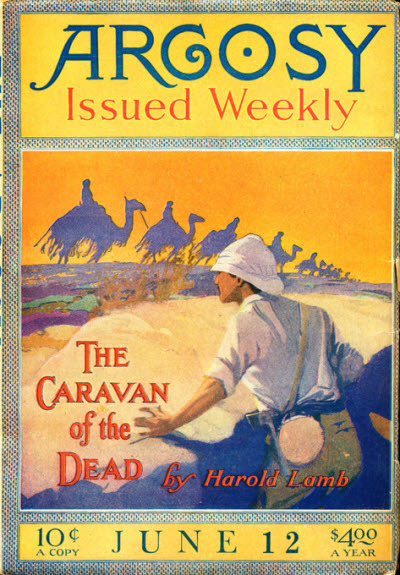 Combined edition of serialized The Caravan of the Dead (Argosy, June 12, June 19, June 26, July 3, July 10 and July 17, 1920). Swords from the East , Howard Andrew Jones, ed., Lincoln, Nebraska: Bison, 2010, pp. 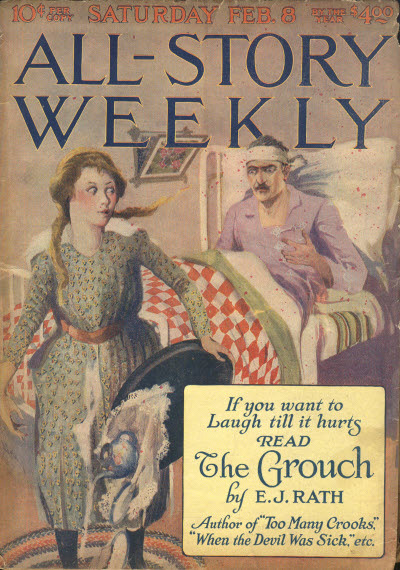 1-11, with cover illustration by Darrel Stevens. Swords from the East , Howard Andrew Jones, ed., Lincoln, Nebraska: Bison, 2010, pp. 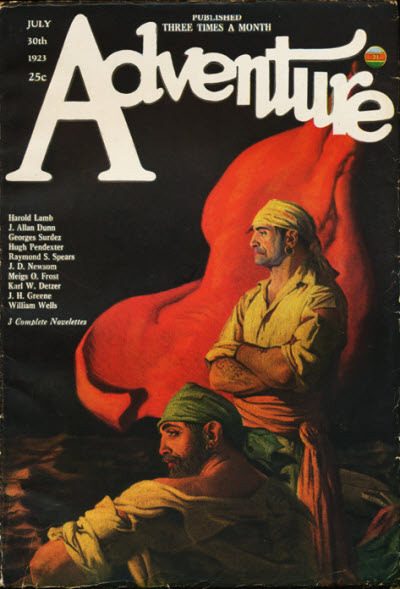 12-52, with cover illustration by Darrel Stevens. Swords from the East , Howard Andrew Jones, ed., Lincoln, Nebraska: Bison, 2010, pp. 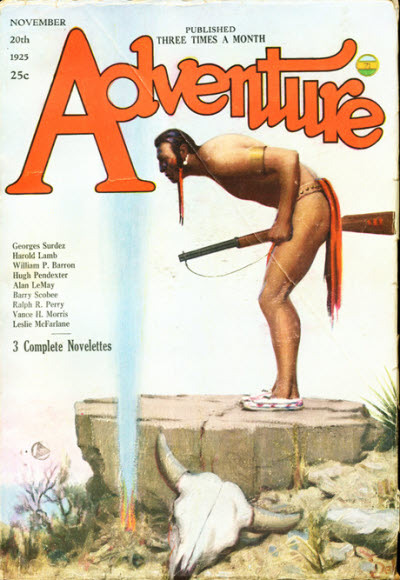 340-352, with cover illustration by Darrel Stevens. Swords of the Steppes , Howard Andrew Jones, ed., Lincoln, Nebraska: Bison, 2007, pp. 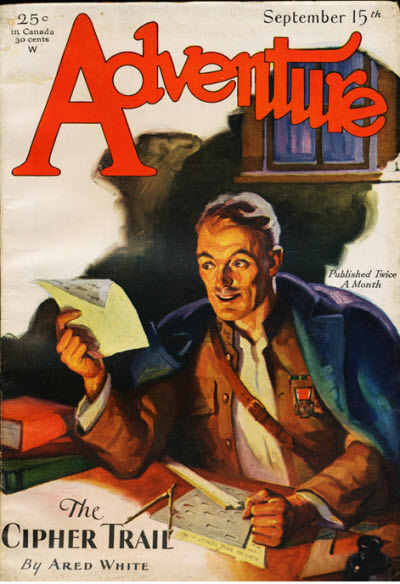 414-427, with cover illustration by Darrel Stevens. Swords from the East , Howard Andrew Jones, ed., Lincoln, Nebraska: Bison, 2010, pp. 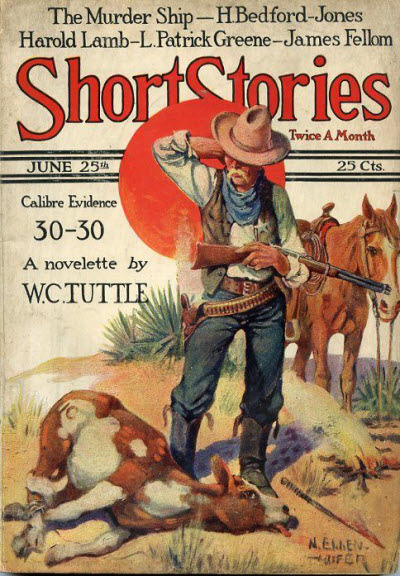 205-326, with cover illustration by Darrel Stevens. "The Voice in the Drum," in Short Stories, Vol. 102, No. 2 (No. 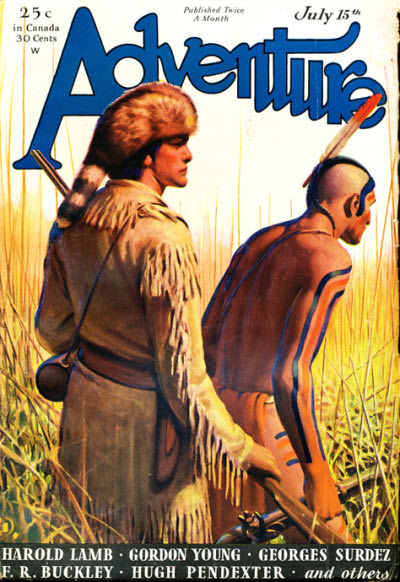 411), January 25, 1923, pp. 74-87. "The Man Who Measured the Wind," in Short Stories, Vol. 102, No. 5 (No. 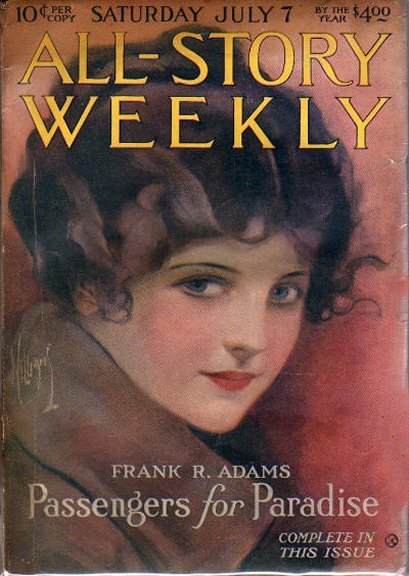 414), March 10, 1923, pp. 120-148. 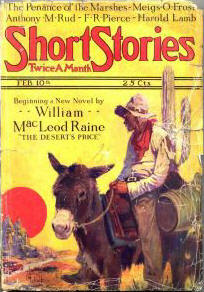 "The Desert Driver," in Short Stories, Vol. 103, No. 6 (No. 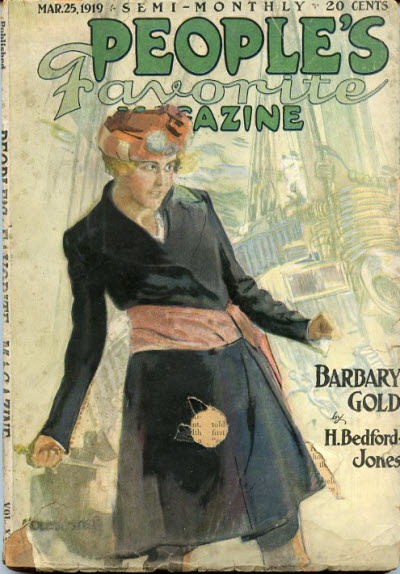 421), June 25, 1923, pp. 126-149 (Warner the Collector series). Riders of the Steppes , Howard Andrew Jones, ed., Lincoln, Nebraska: Bison, 2007, pp. 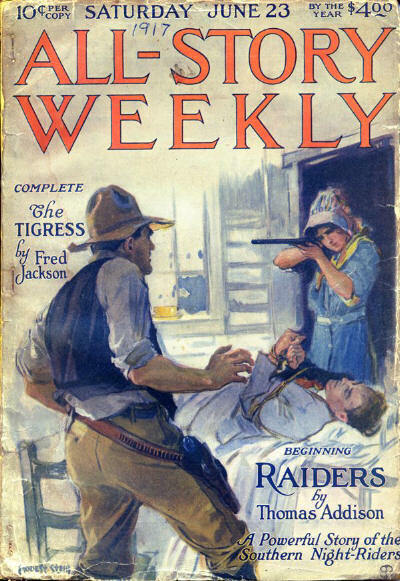 1-18, with cover illustration by Darrel Stevens. "The Hundred Visitors," in Short Stories, Vol. 104, No. 1 (No. 422), July 10, 1923, pp. 142-159 (Warner the Collector series). The Three Palladins , Harold Lamb, West Kingston, Rhode Island: Grant, 1977 (limited 1350 copy edition), with dust jacket illustration by Cathy Hill. 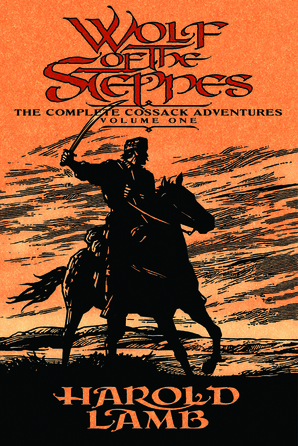 Combined edition of serialized The Three Palladins. 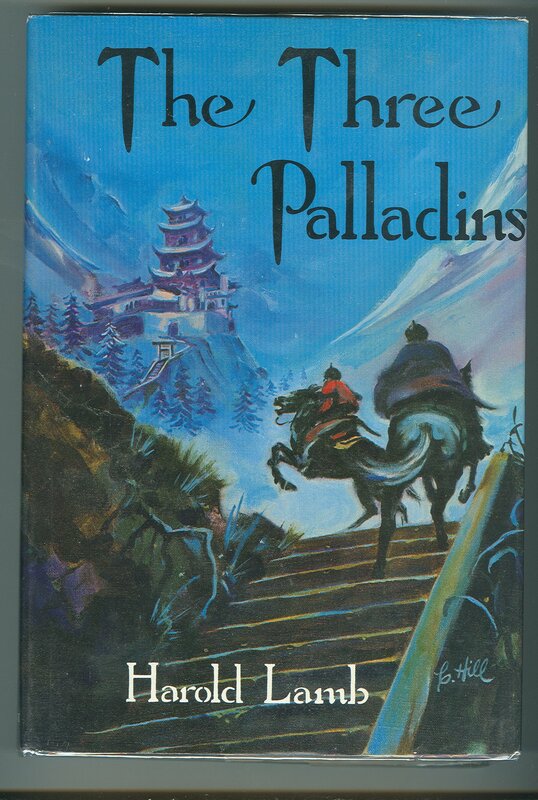 The Three Palladins , Harold Lamb, West Kingston, Rhode Island: Grant, 1977 (limited 2000 copy edition), with dust jacket illustration by Cathy Hill. Swords from the East , Howard Andrew Jones, ed., Lincoln, Nebraska: Bison, 2010, pp. 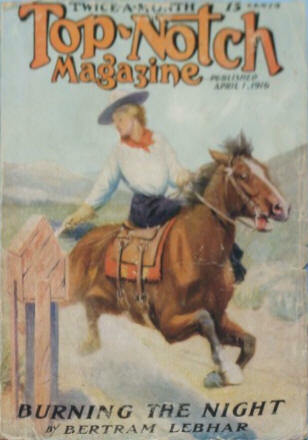 53-191, with cover illustration by Darrel Stevens. Riders of the Steppes , Howard Andrew Jones, ed., Lincoln, Nebraska: Bison, 2007, pp. 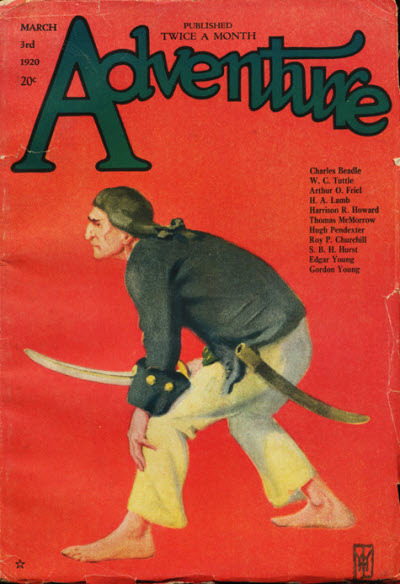 19-42, with cover illustration by Darrel Stevens. Riders of the Steppes , Howard Andrew Jones, ed., Lincoln, Nebraska: Bison, 2007, pp. 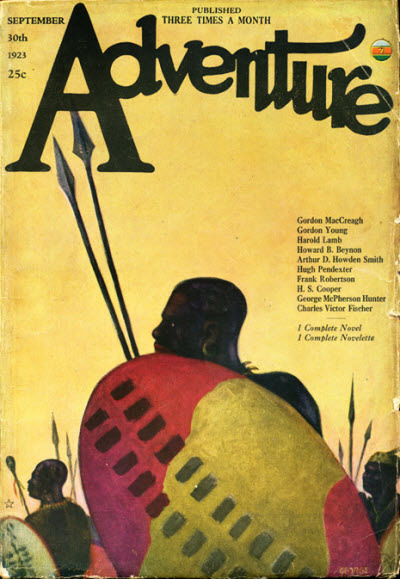 43-61, with cover illustration by Darrel Stevens. Riders of the Steppes , Howard Andrew Jones, ed., Lincoln, Nebraska: Bison, 2007, pp. 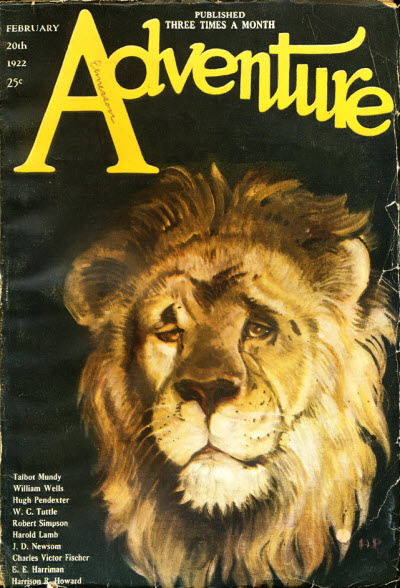 62-132, with cover illustration by Darrel Stevens. "The Devil's Bungalow," in Short Stories, Vol. 106, No. 2 (No. 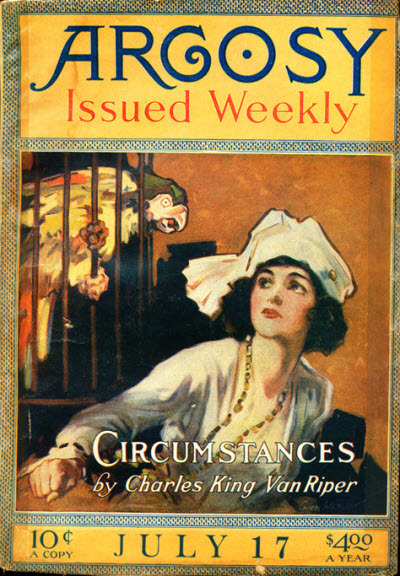 435), January 25, 1924, pp. 125-151 . Riders of the Steppes , Howard Andrew Jones, ed., Lincoln, Nebraska: Bison, 2007, pp. 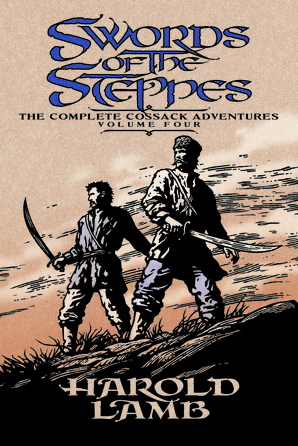 133-260, with cover illustration by Darrel Stevens. "Mr. Three," in Short Stories, Vol. 106, No. 3 (No. 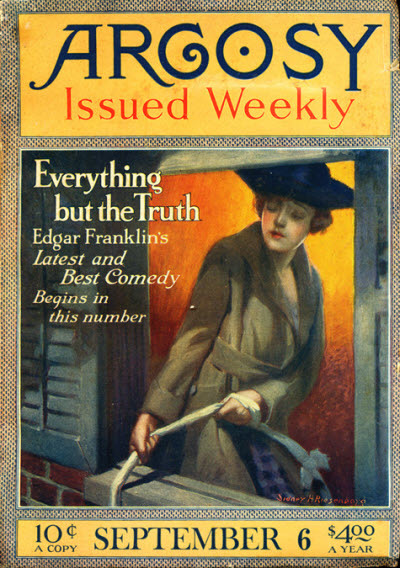 436), February 10, 1924, pp. 110-158 (Warner the Collector series). Swords from the West , Howard Andrew Jones, ed., Lincoln, Nebraska: Bison, 2009, pp. 344-474, with cover illustration by Darrel Stevens. 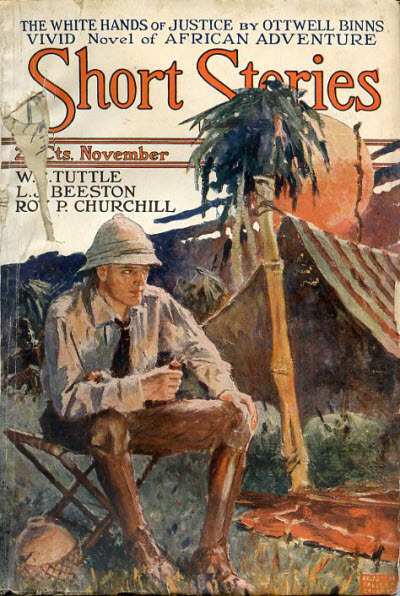 "The Camp of the Snake," in Short Stories, Vol. 108, No. 1 (No. 446), July 10, 1924, pp. 113-140. Swords from the Sea , Howard Andrew Jones, ed., Lincoln, Nebraska: Bison, 2010, pp. 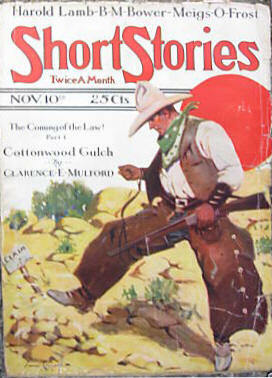 180-235, with cover illustration by Darrel Stevens. 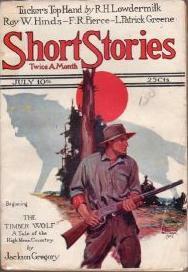 "The Buffalo Bear," in Short Stories, Vol. 109, No. 2 (No. 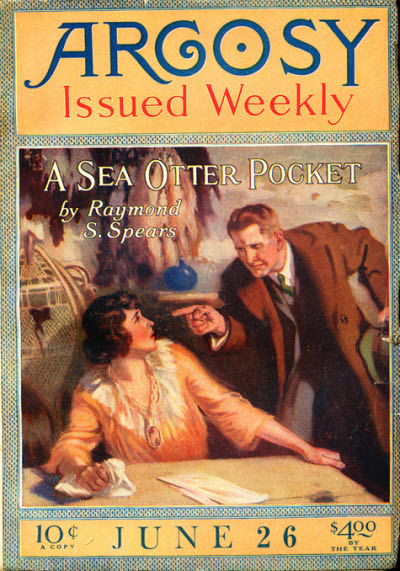 454), November 10, 1924, pp. 138-158. Swords from the Sea , Howard Andrew Jones, ed., Lincoln, Nebraska: Bison, 2010, pp. 236-382, with cover illustration by Darrel Stevens. Swords From the Sea , Howard Andrew Jones, ed., Lincoln, Nebraska: Bison, 2010, pp. 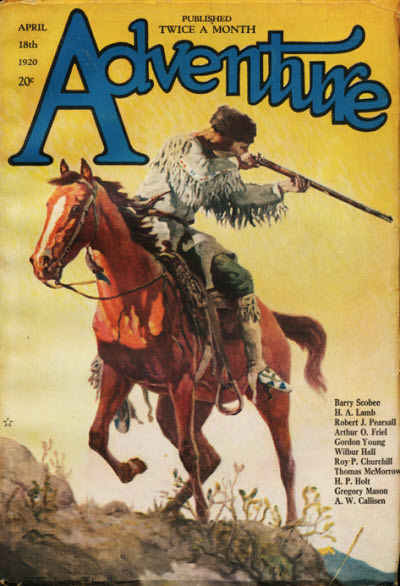 27-140, with cover illustration by Darrel Stevens. The Curved Saber , uncredited editor, Garden City, New York: Doubleday, 1964, pp. 511-568, with dust jacket photograph by James Viles. Riders of the Steppes , Howard Andrew Jones, ed., Lincoln, Nebraska: Bison, 2007, pp. 261-315, with cover illustration by Darrel Stevens. Swords of the Steppes , Howard Andrew Jones, ed., Lincoln, Nebraska: Bison, 2007, pp. 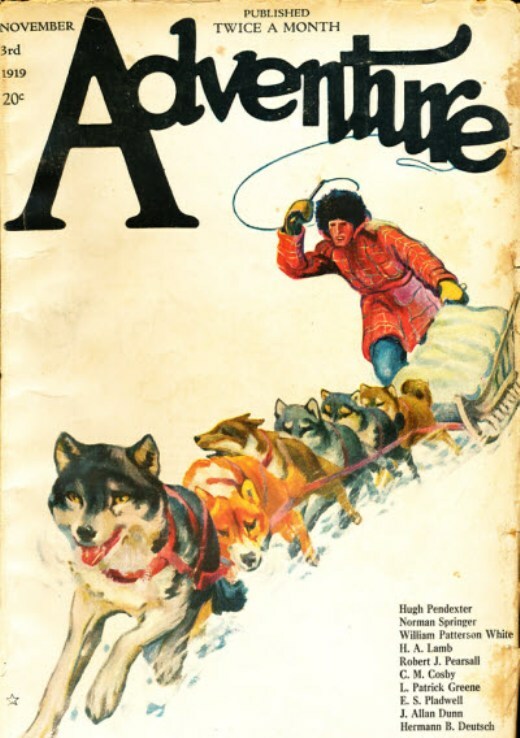 321-382, with cover illustration by Darrel Stevens. 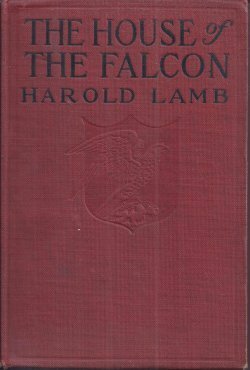 White Falcon , Harold Lamb, New York: McBride, 1926, without dust jacket. 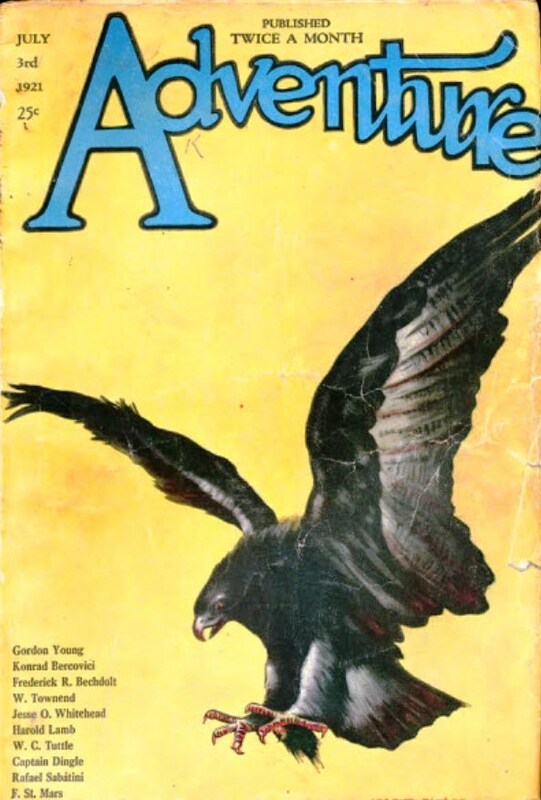 Combined edition of serialized White Falcon. Riders of the Steppes , Howard Andrew Jones, ed., Lincoln, Nebraska: Bison, 2007, pp. 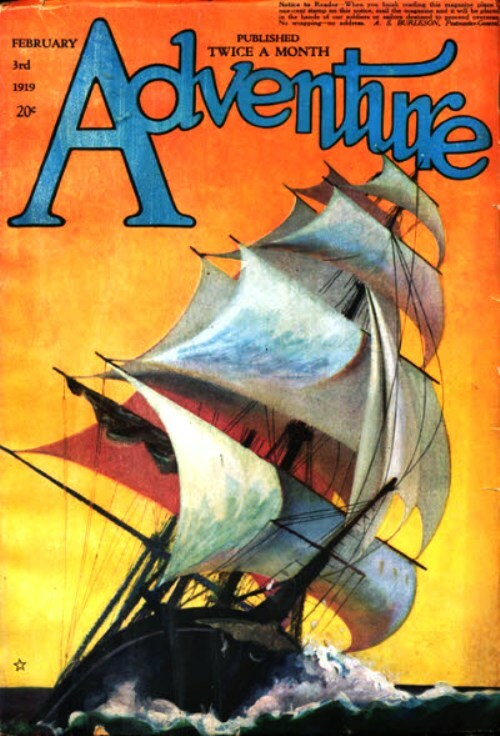 316-458, with cover illustration by Darrel Stevens. The Mighty Manslayer , Marc B. Haefele, ed. (uncredited), Garden City, New York: Doubleday, 1969, pp. 157-230, with dust jacket illustration by Saul Lambert. Riders of the Steppes , Howard Andrew Jones, ed., Lincoln, Nebraska: Bison, 2007, pp. 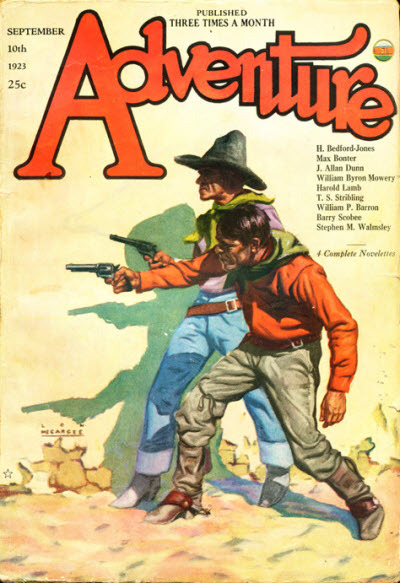 459-518, with cover illustration by Darrel Stevens. Swords from the Desert , Howard Andrew Jones, ed., Lincoln, Nebraska: Bison, 2009, pp. 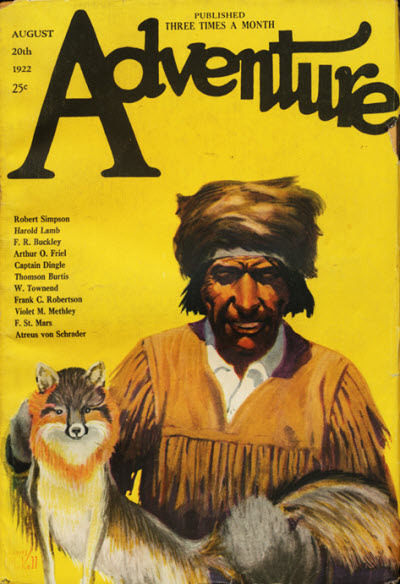 17-68, with cover illustration by Darrel Stevens. 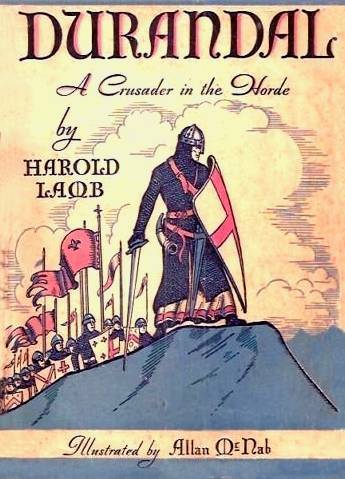 Durandal: A Crusader in the Horde , Harold Lamb, New York: Doubleday, 1931, with dust jacket and interior illustrations by Allan McNab. 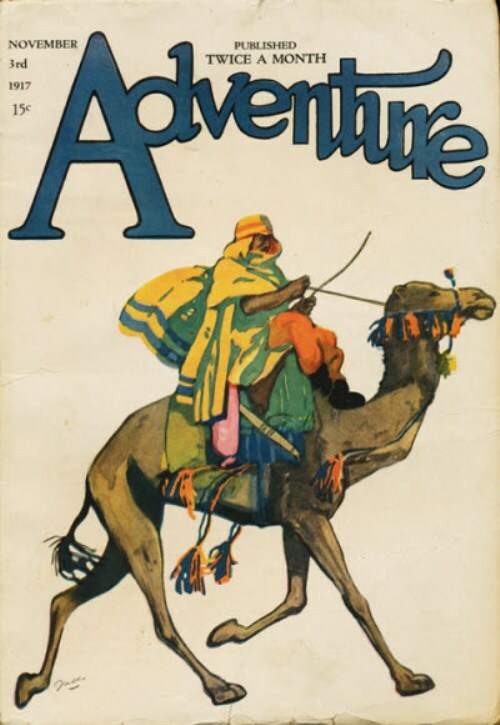 Combines "Durandal" (Adventure, September 23, 1926), "The Sea of the Ravens" (Adventure, January 15, 1927) and "Rusudan" (Adventure, May 1, 1927). Durandal , Harold Lamb, Hampton Falls, New Hampshire: Donald M. Grant, 1981, with dust jacket and interior illustrations by George Barr and Alicia Austin. 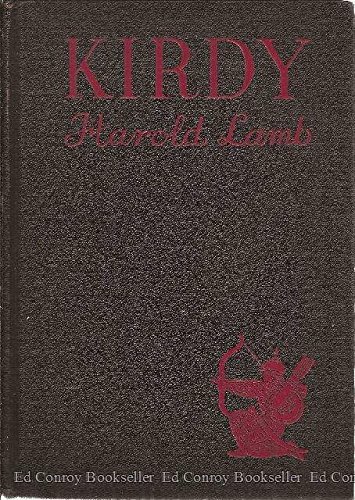 as Kirdy , Harold Lamb, New York: Doubleday, 1933, with frontispiece and endpaper illustration by Boris Artzybasheff. in Swords of the Steppes , Howard Andrew Jones, ed., Lincoln, Nebraska: Bison, 2007, pp. 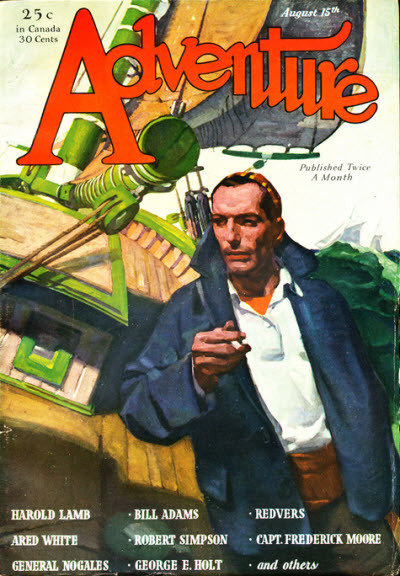 414-427, with cover illustration by Darrel Stevens. 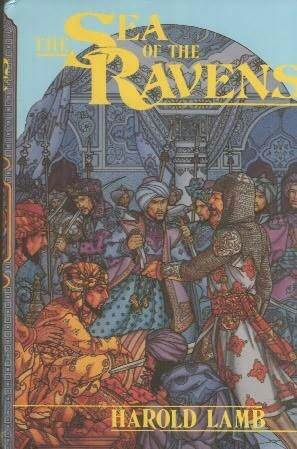 The Sea of the Ravens , Harold Lamb, Hampton Falls, New Hampshire: Donald M. Grant, 1983, with dust jacket and interior illustrations by George Barr and Alicia Austin. Swords from the West , Howard Andrew Jones, ed., Lincoln, Nebraska: Bison, 2009, pp. 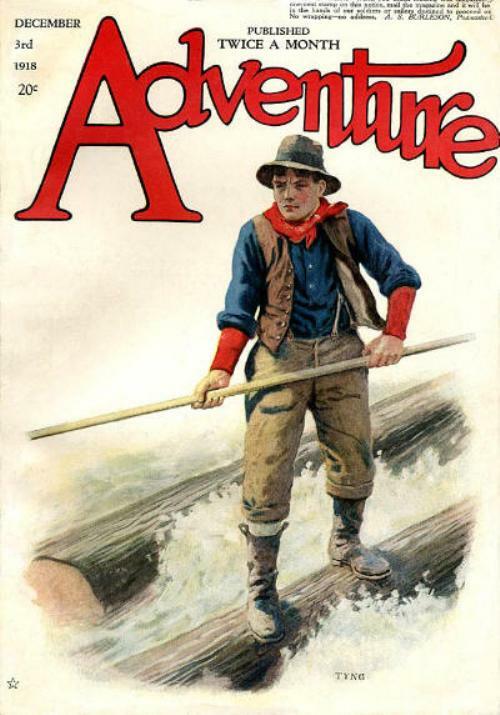 1-15, with cover illustration by Darrel Stevens. Swords of the Steppes , Howard Andrew Jones, ed., Lincoln, Nebraska: Bison, 2007, pp. 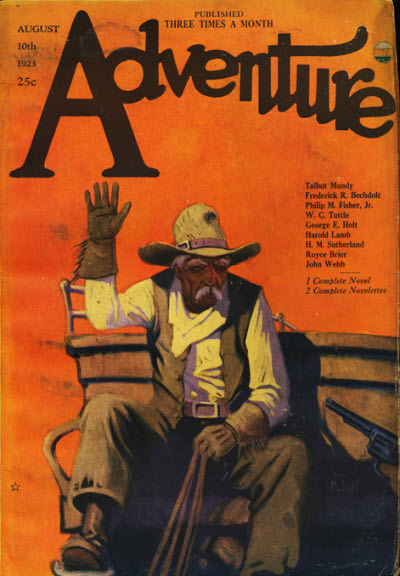 458-503, with cover illustration by Darrel Stevens. Swords of the Steppes , Howard Andrew Jones, ed., Lincoln, Nebraska: Bison, 2007, pp. 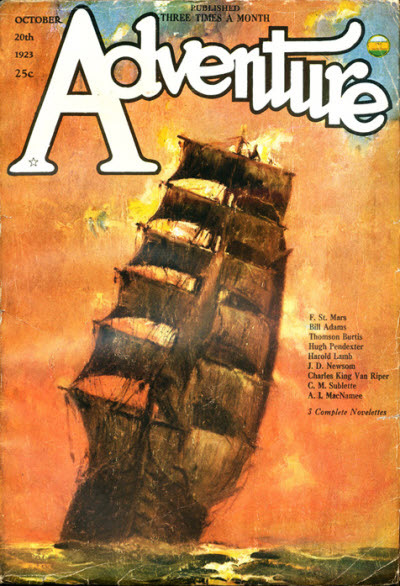 146-222, with cover illustration by Darrel Stevens. Swords of the Steppes , Howard Andrew Jones, ed., Lincoln, Nebraska: Bison, 2007, pp. 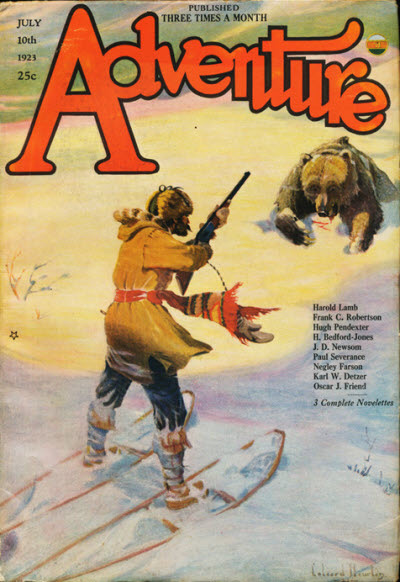 223-238, with cover illustration by Darrel Stevens. Swords of the Steppes , Howard Andrew Jones, ed., Lincoln, Nebraska: Bison, 2007, pp. 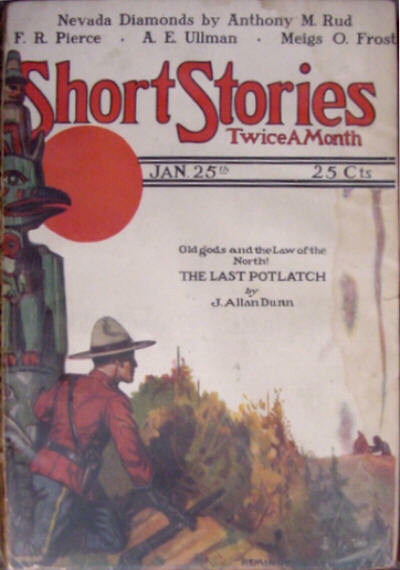 239-256, with cover illustration by Darrel Stevens. 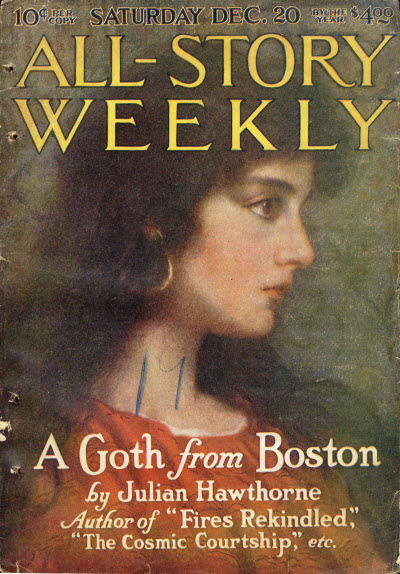 "Home from Bethlehem," in Collier's Weekly, Vol. __, No. __, December 19, 1931, pp. 14-15. Swords of the Steppes , Howard Andrew Jones, ed., Lincoln, Nebraska: Bison, 2007, pp. 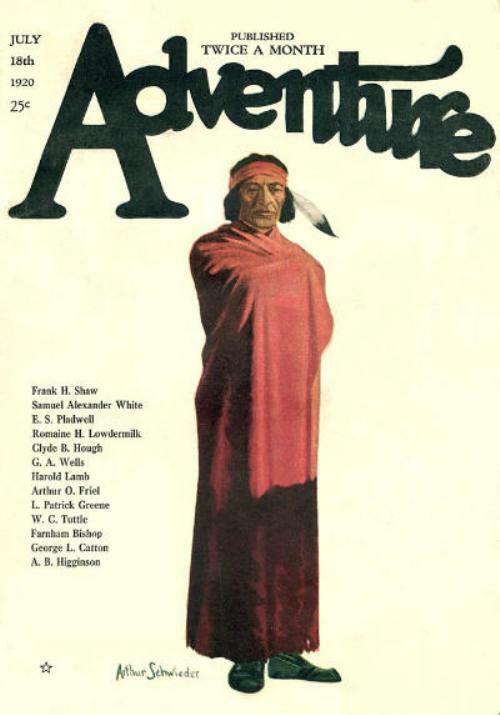 257-304, with cover illustration by Darrel Stevens. 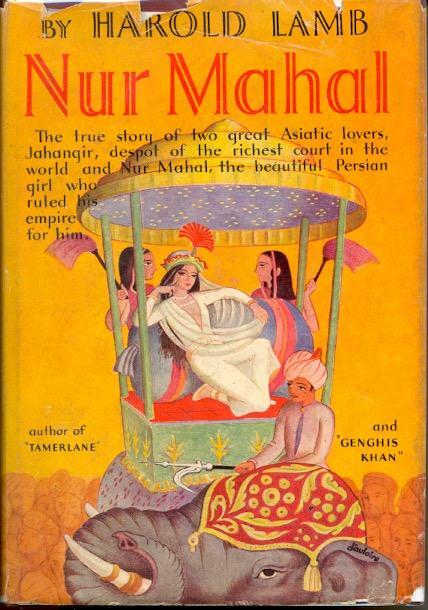 Nur Mahal , Harold Lamb, New York: Doubleday, 1935, with dust jacket illustration by unknown artist and interior illustration by Edgar D'Aulaire. 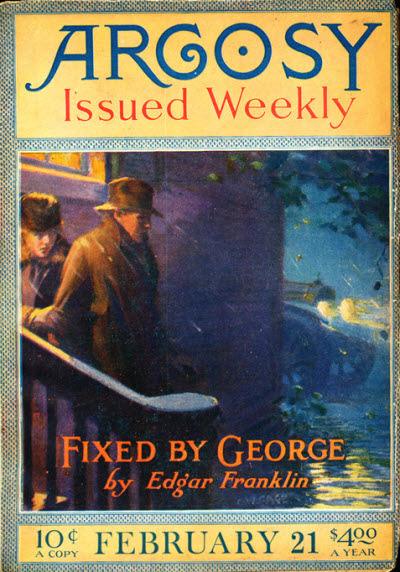 "Where Love Comes First," in Collier's Weekly, Vol. __, No. __, April 15, 1933, pp. 10-11. Kirdy: The Road Out of the World , Harold Lamb, New York: Doubleday, 1933, with frontispiece and endpaper illustration by Boris Artzybasheff. 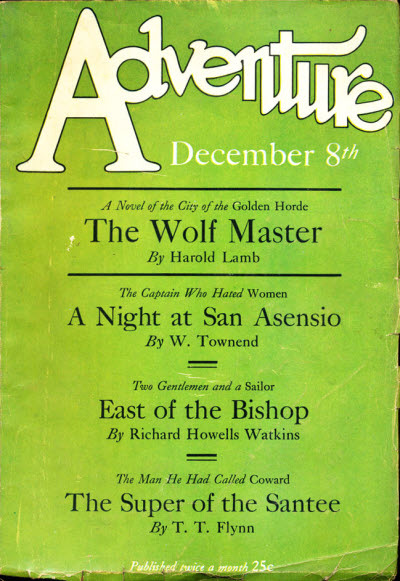 Originally published as "The Wolf Master" in Adventure, December 1926. Swords of the Steppes , Howard Andrew Jones, ed., Lincoln, Nebraska: Bison, 2007, pp. 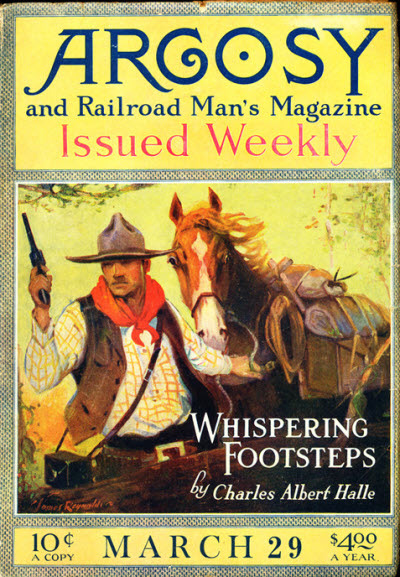 428-443, with cover illustration by Darrel Stevens. 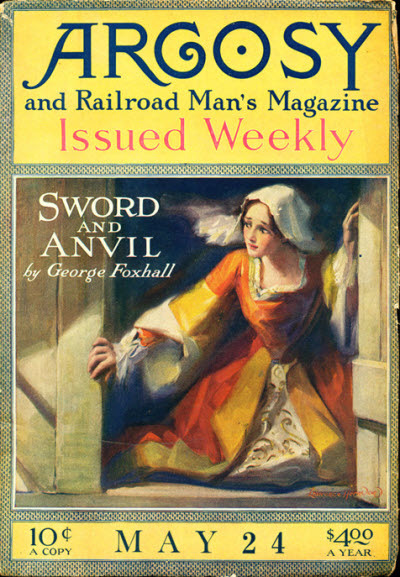 "At Alexander's Palace," in Collier's Weekly, Vol. __, No. __, April 21, 1934, pp. 24-44. 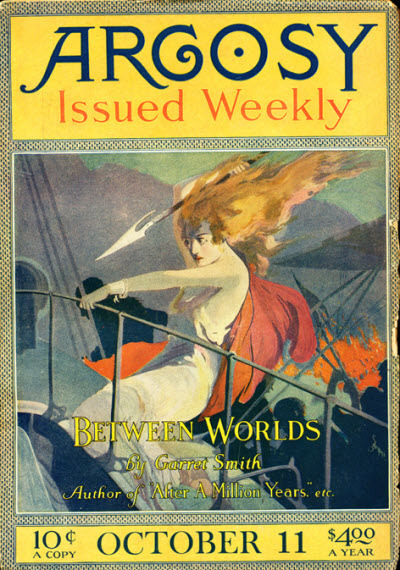 "Behind the Veil," in Collier's Weekly, Vol. __, No. __, June 2, 1934, pp. 14-15. 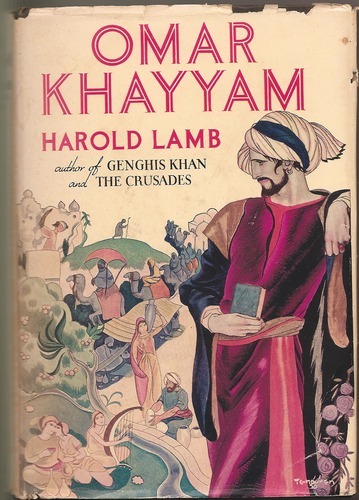 Omar Khayyam , Harold Lamb, New York: Doubleday, 1936, with dust jacket illustration by unknown artist. Swords of the Steppes , Howard Andrew Jones, ed., Lincoln, Nebraska: Bison, 2007, pp. 383-401, with cover illustration by Darrel Stevens. Swords of the Steppes , Howard Andrew Jones, ed., Lincoln, Nebraska: Bison, 2007, pp. 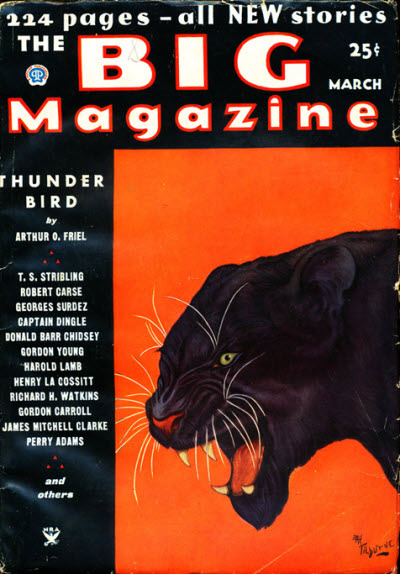 305-320, with cover illustration by Darrel Stevens. Swords of the Steppes , Howard Andrew Jones, ed., Lincoln, Nebraska: Bison, 2007, pp. 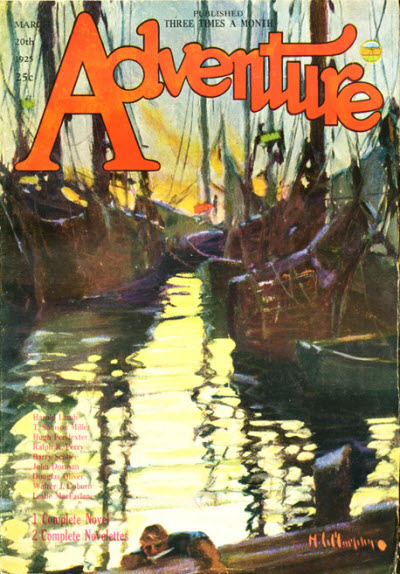 444-457, with cover illustration by Darrel Stevens. Swords of the Steppes , Howard Andrew Jones, ed., Lincoln, Nebraska: Bison, 2007, pp. 504-517, with cover illustration by Darrel Stevens. Swords of the Steppes , Howard Andrew Jones, ed., Lincoln, Nebraska: Bison, 2007, pp. 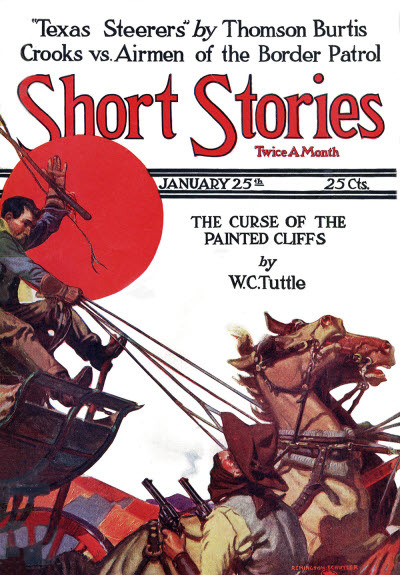 518-530, with cover illustration by Darrel Stevens. Swords of the Steppes , Howard Andrew Jones, ed., Lincoln, Nebraska: Bison, 2007, pp. 531-543, with cover illustration by Darrel Stevens. Swords of the Steppes , Howard Andrew Jones, ed., Lincoln, Nebraska: Bison, 2007, pp. 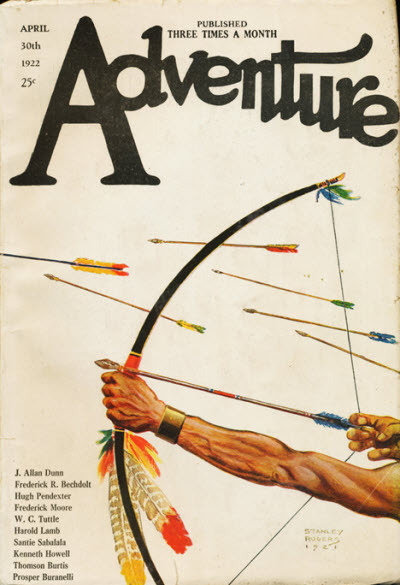 558-571, with cover illustration by Darrel Stevens. Swords of the Steppes , Howard Andrew Jones, ed., Lincoln, Nebraska: Bison, 2007, pp. 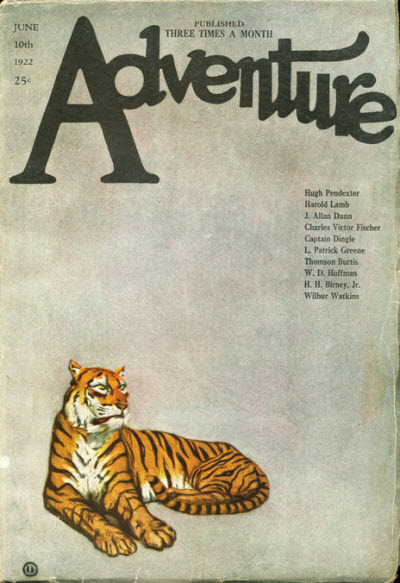 544-557, with cover illustration by Darrel Stevens. Swords of the Steppes , Howard Andrew Jones, ed., Lincoln, Nebraska: Bison, 2007, pp. 402-513, with cover illustration by Darrel Stevens. 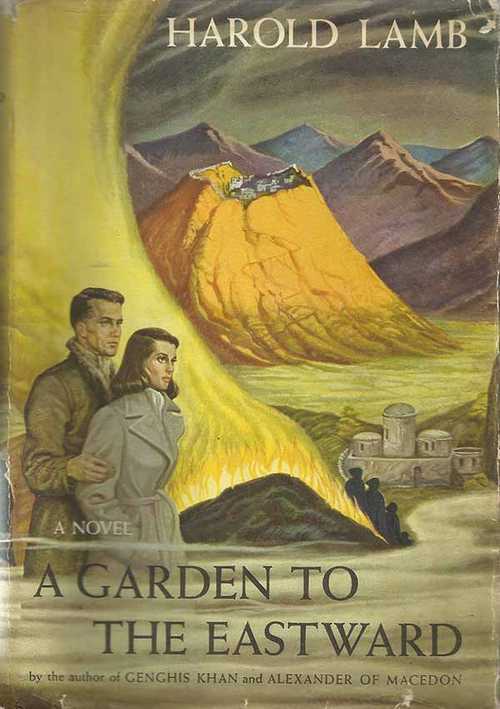 A Garden to the Eastward , Harold Lamb, London: Robert Hale, 1950, with dust jacket illustration by uncredited artist (UK edition). • "The Winged Rider" (1926). The Mighty Manslayer , Marc B. Haefele, ed. (uncredited), New York: Modern Literary (Curtis Books), 1969, with cover illustration by unknown artist. 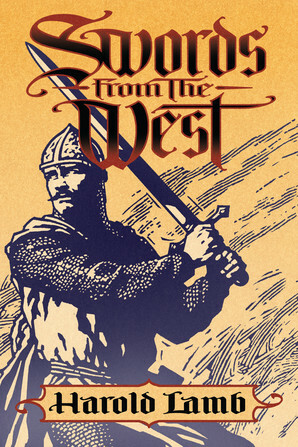 This bibliography has been compiled from actual editions of the listed works contained in the Zaporogian Siech hoard, from Howard Andrew Jones's The Curved Saber ("The Official Harold Lamb Site"), from William G. Contento's and Phil Stephensen-Payne's FictionMags Index, from Vitaly Karatsupa's Archive of Fiction (in Russian: Google's English translation), from the Bookogs Harold Lamb entry and from the The Unz Review archive of Harold Lamb works. Any errors in compilation here are nevertheless solely the responsibility of Zarthani.net. ©2017-2019 by Zarthani.net. The contents of this Web site are for personal, non-commercial use only. Any use of copyrighted material or trademarks anywhere on this site and its files should not be viewed as a challenge to those copyrights or trademarks. In addition, any material displayed on or served by this site cannot be republished or distributed without explicit consent from Zarthani.net.